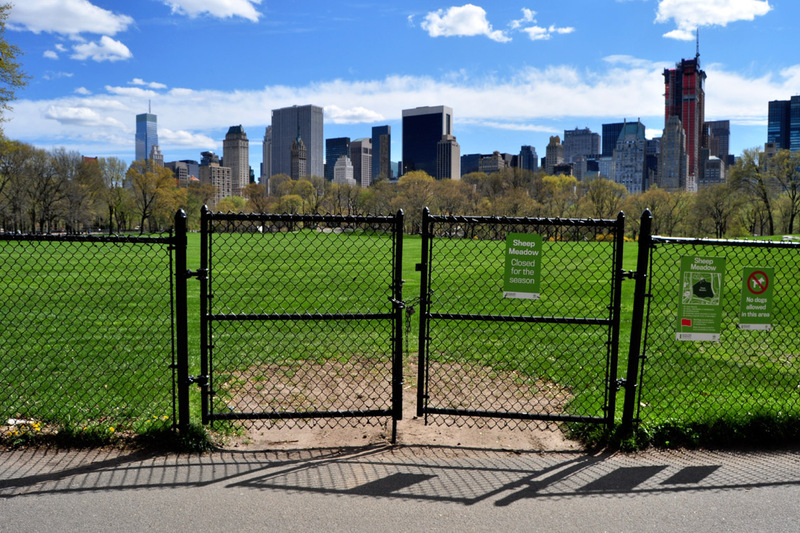 It’s not easy to plan a trip to Central Park with an endpoint in mind, especially if you are easily distracted. This isn’t a bad thing – just something to be conscious of if time is of the essence. Yesterday, I had some time. 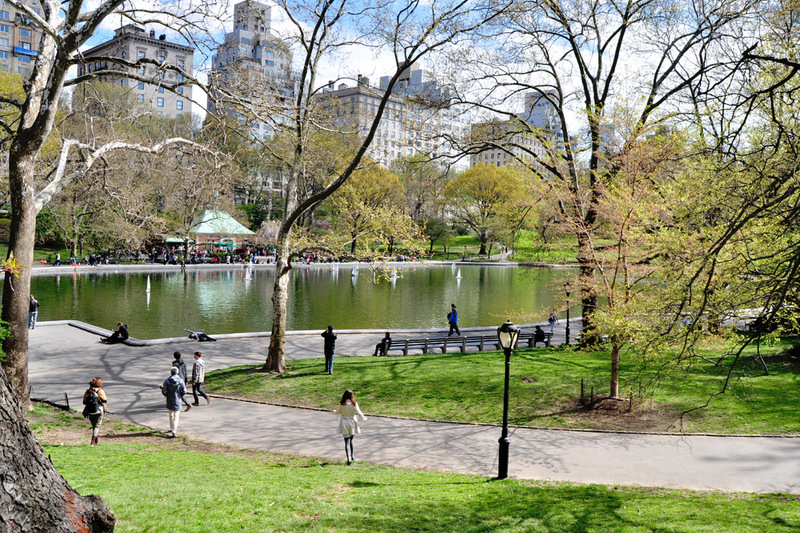 These past few days, it really feels as if winter has left the City, especially in Central Park. 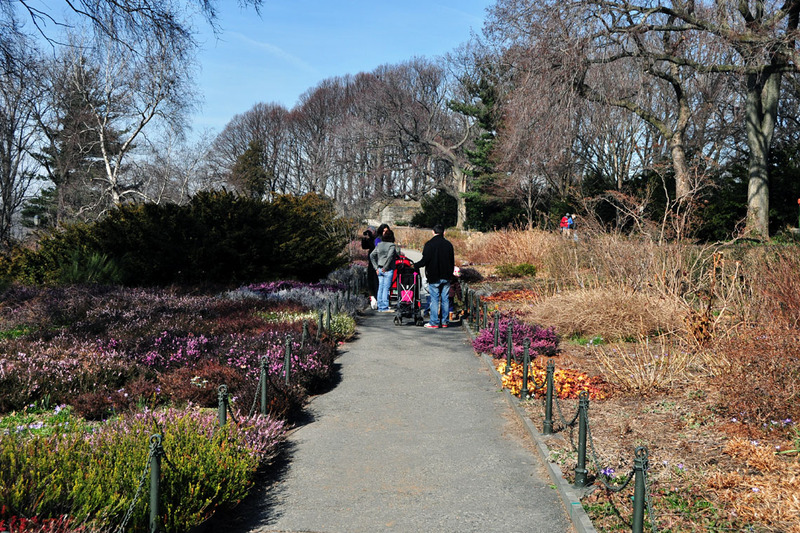 It’s as if Spring took a brush and brightened its expanse with a fresh coat of paint. 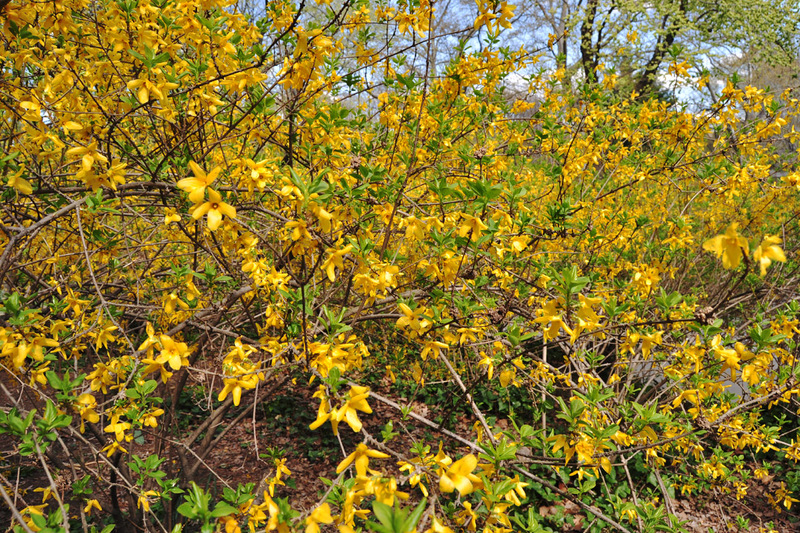 New leaves grow into winter’s space, filling it in with shades of green; baby buds and blooms garner attention – their stems and branches reaching out, decorated in different shades of yellow and pink. 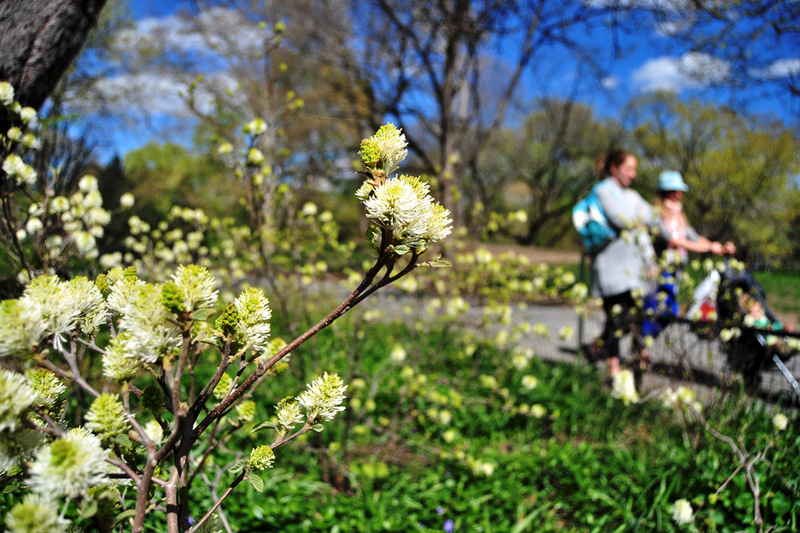 Along with the fruits of a new season, Central Park has come alive with people. 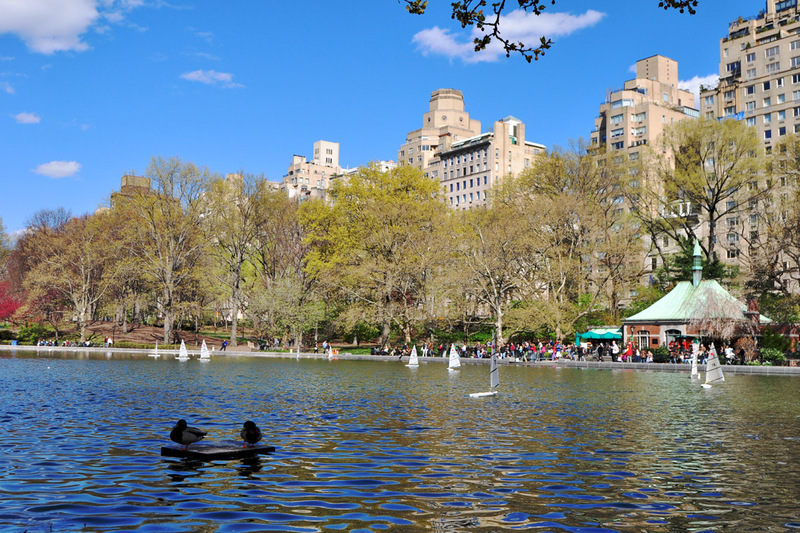 New Yorkers once again embrace the lush foliage of their extended backyard; ducks welcome newcomers to the water – they happily float alongside row- and remote-controlled sailboats. 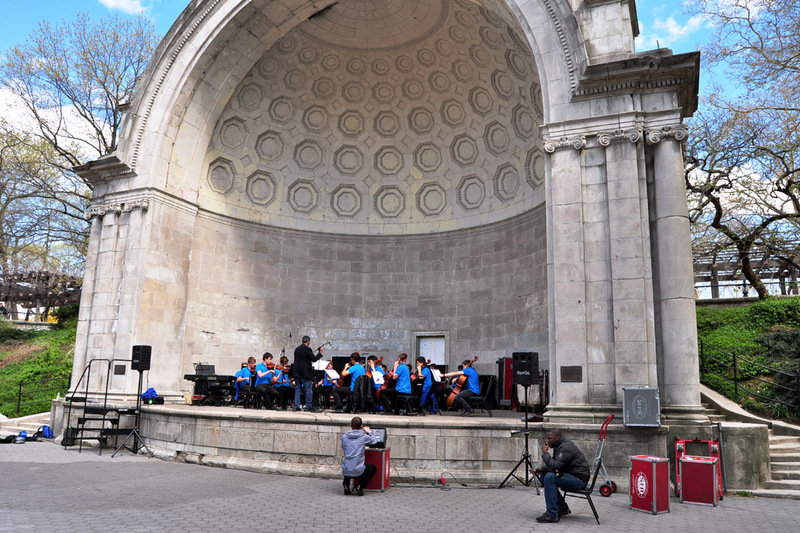 Just as I was sidetracked on my last trip to Central Park, I was distracted again yesterday. 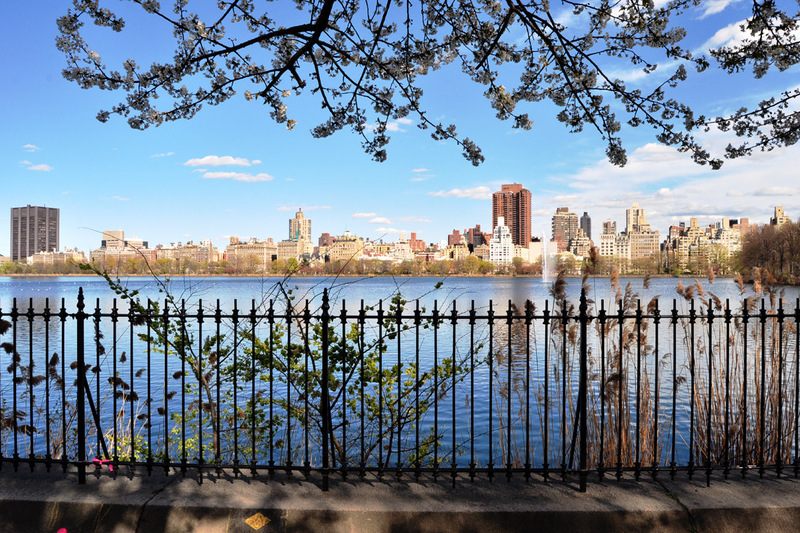 Sheer determination got me to the Jackie Kennedy Onassis Reservoir, a place I’d missed out on seeing a few weeks ago for its cherry blossoms. I made it; I saw the blooms surrounding it. Yet, I was happier for having captured so many lovely moments along the way. Life really is about collecting moments, isn’t it? I hope you’ll enjoy these. 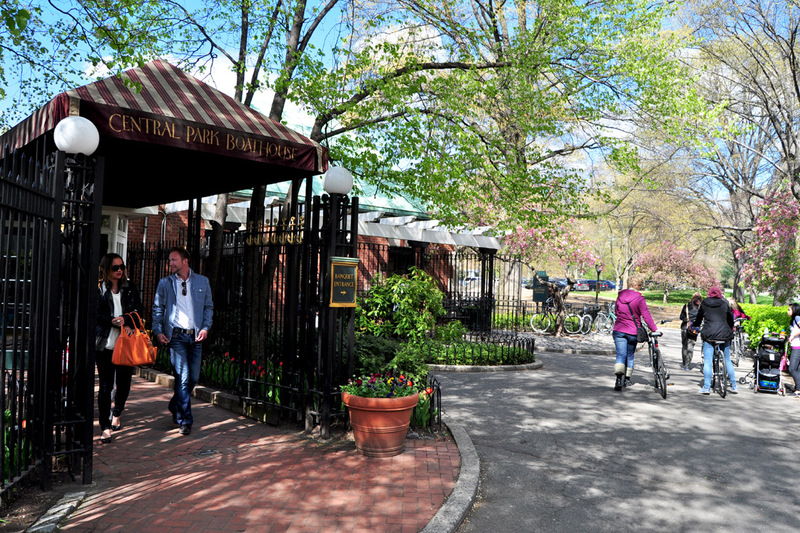 Central Park – Enter and be greeted with a vibrant pop of yellow. 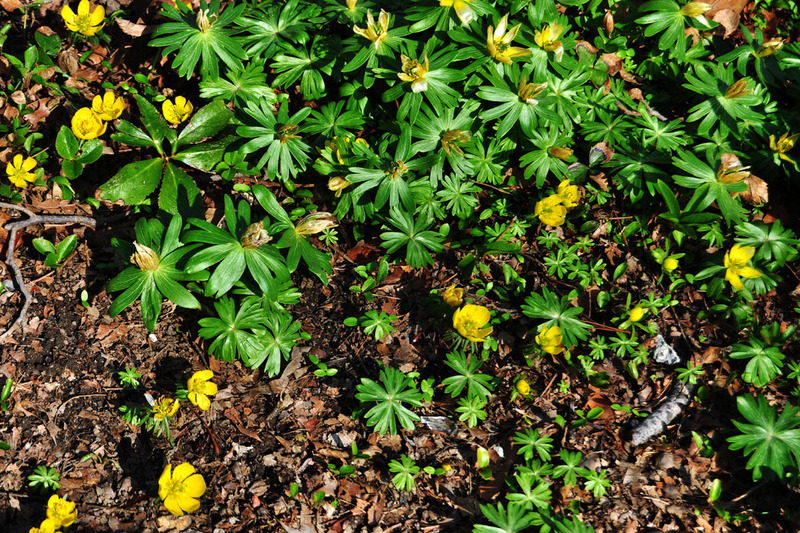 A sunburst, at ground level. 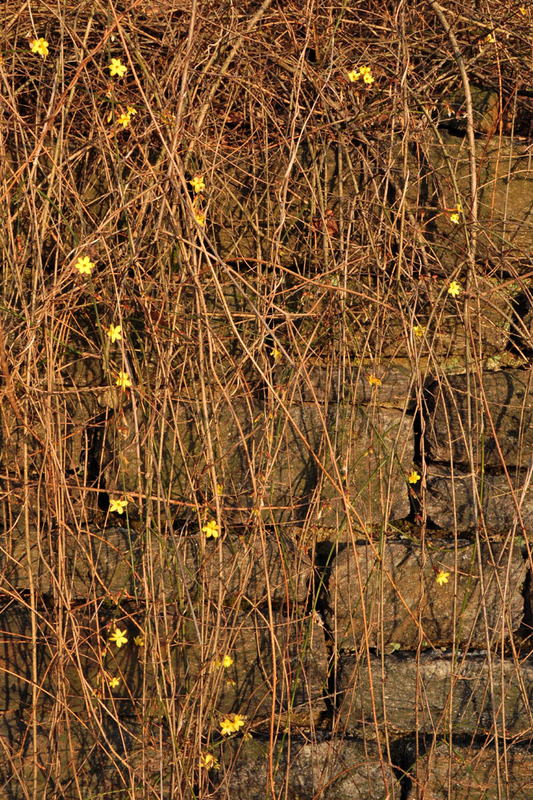 Spot bristly looking blooms, reaching for the sun. How could you not be sidetracked by this skyline? A model view of Manhattan. 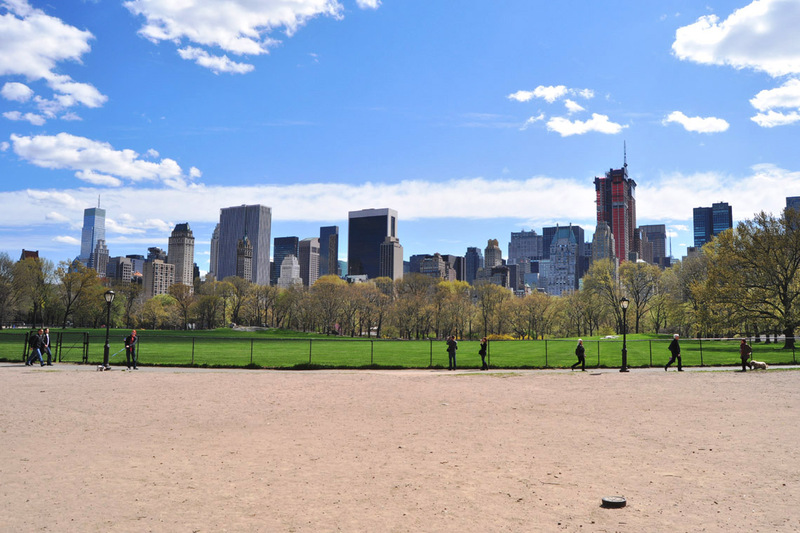 Midtown’s panorama: it looks so peaceful, standing on the sidelines at Sheep Meadow. Reason enough to love New York. 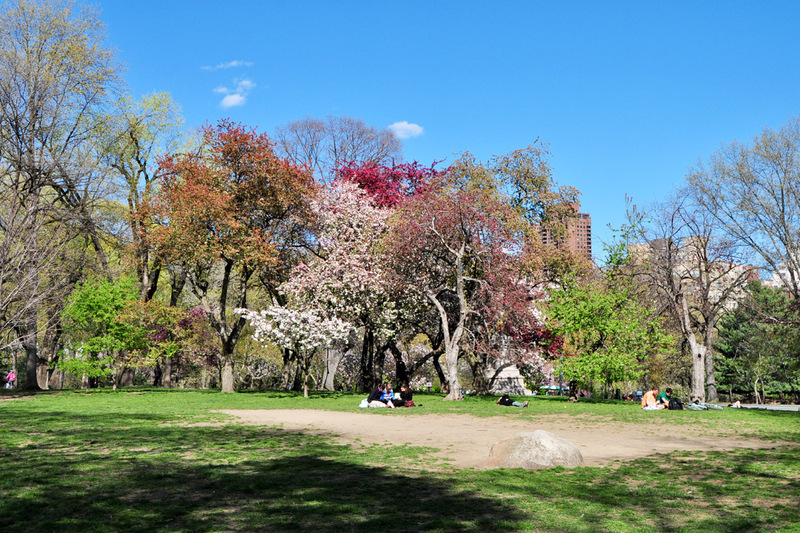 Whilst Sheep Meadow is still gathering strength before it opens its gates to sunbakers and frisbee throwers, there are plenty of other spots to retreat into. Millions of perfect settings in which to linger over a cup of coffee and indulge in an afternoon nap. Open-air shopping at The Mall. 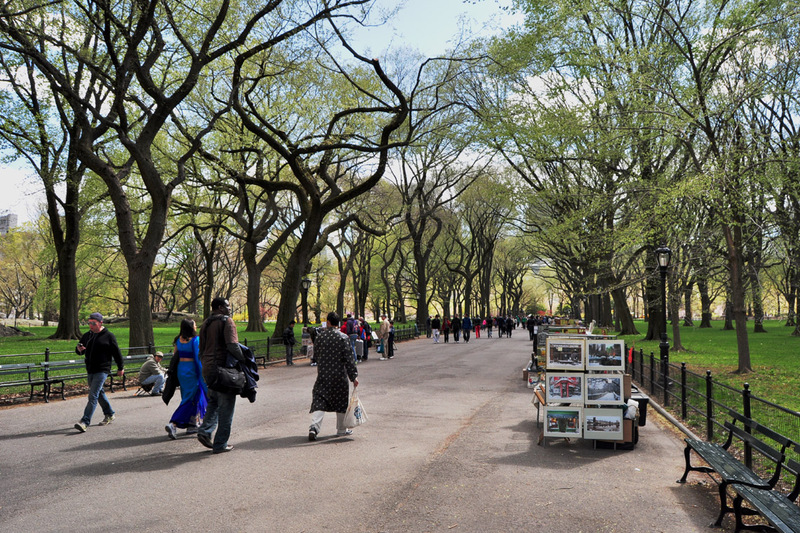 It’s good to see its lined-up elms awake – the green leaves are such a contrast against those dark trunks. 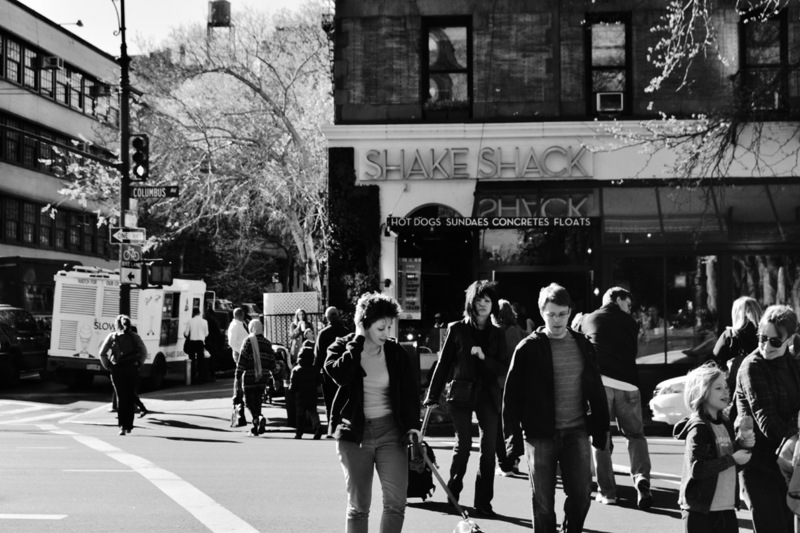 … worthy of a crowd. What a treat to stumble upon. 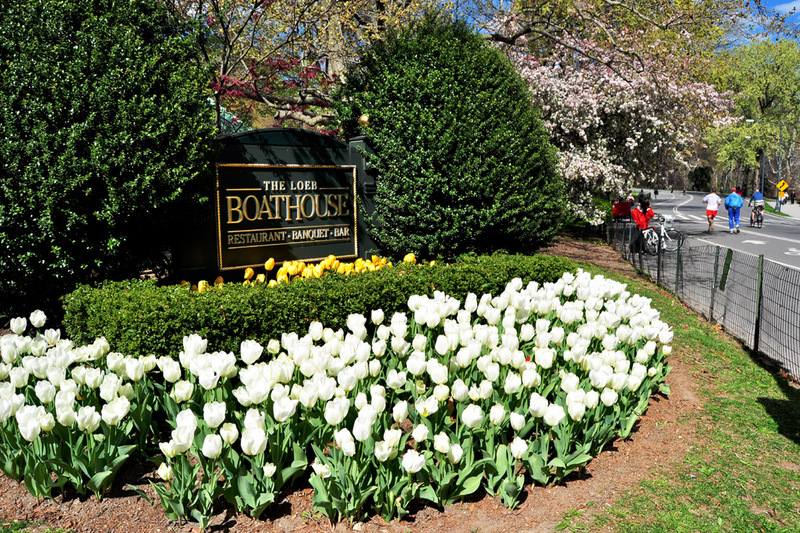 Lunch: at The Loeb Boathouse. 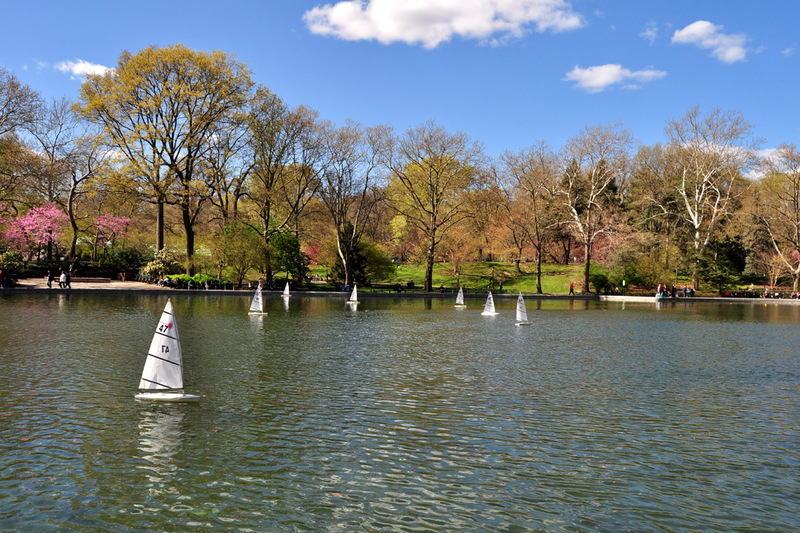 The Conservatory Water, seen from uphill. 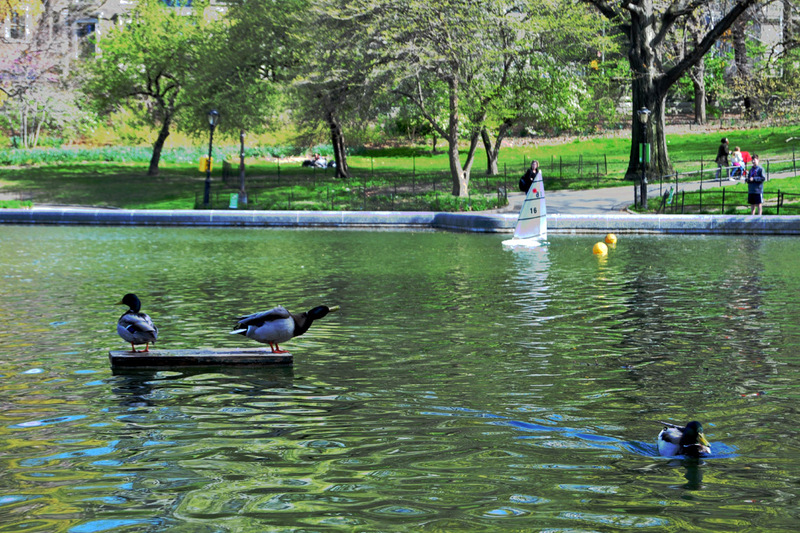 … and ducks float alongside; a couple take a breather on the rectangular buoys. Poised, one looks ready to dive. This is a different kind of buzz taking place in the midst of the most bustling city in the US. 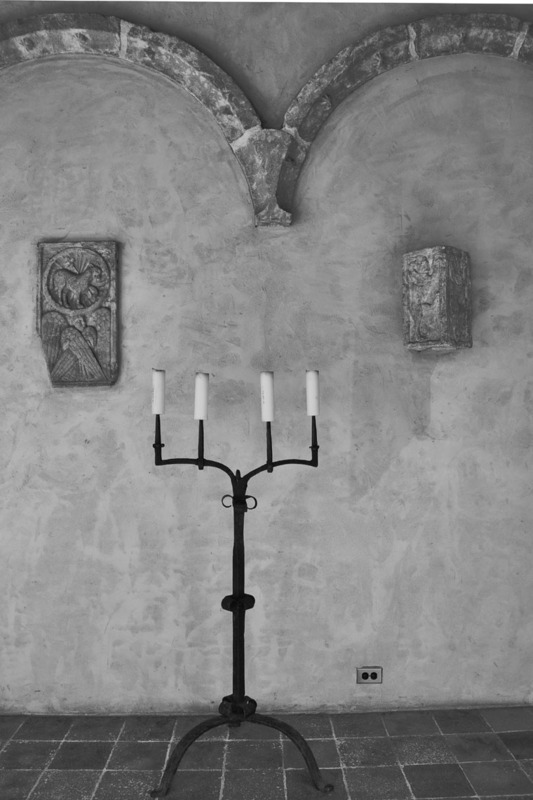 A subdued atmosphere with a positive energy behind it. 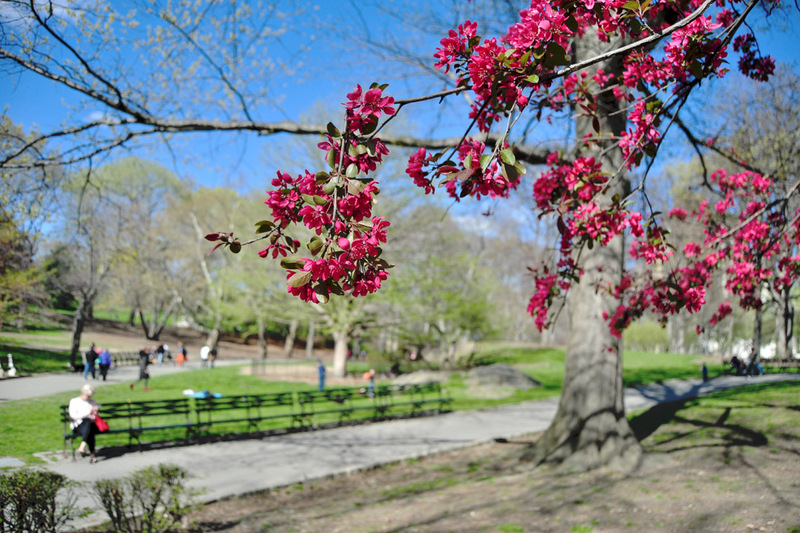 Later… From water activity to a pink blossom sighting. Bustle Alert. 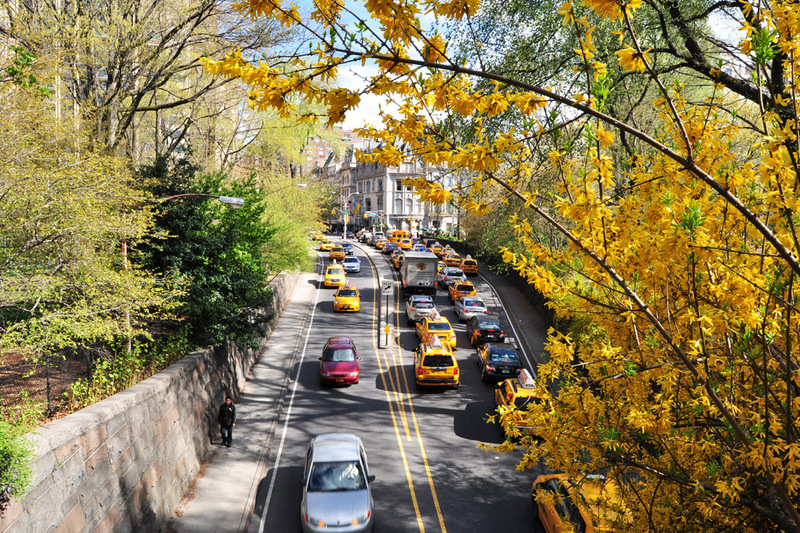 From above: a view of the ubiquitous yellow cabs. 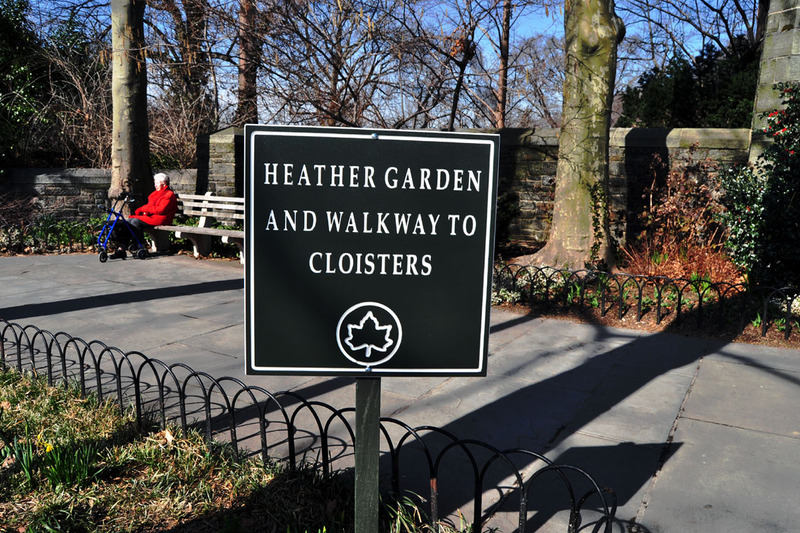 New York City symbolism. 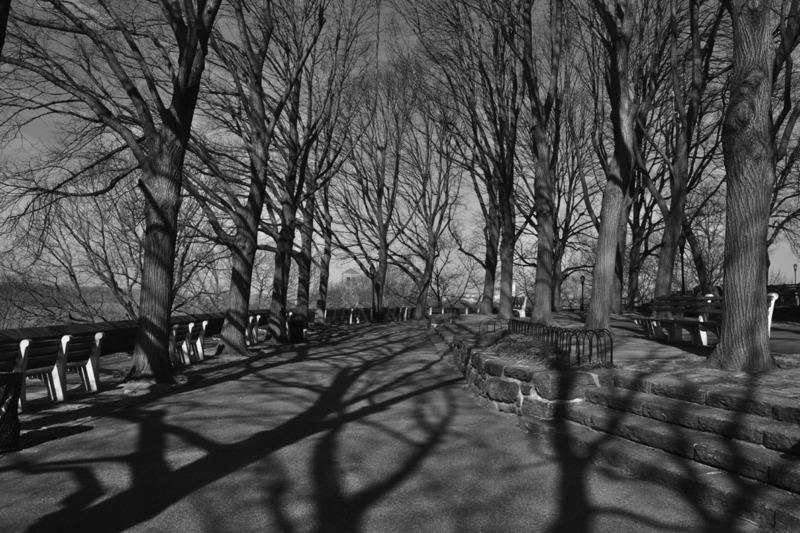 Shadows on The Metropolitan Museum of Art – it sits in the grounds of Central Park. More blossoms along the way. 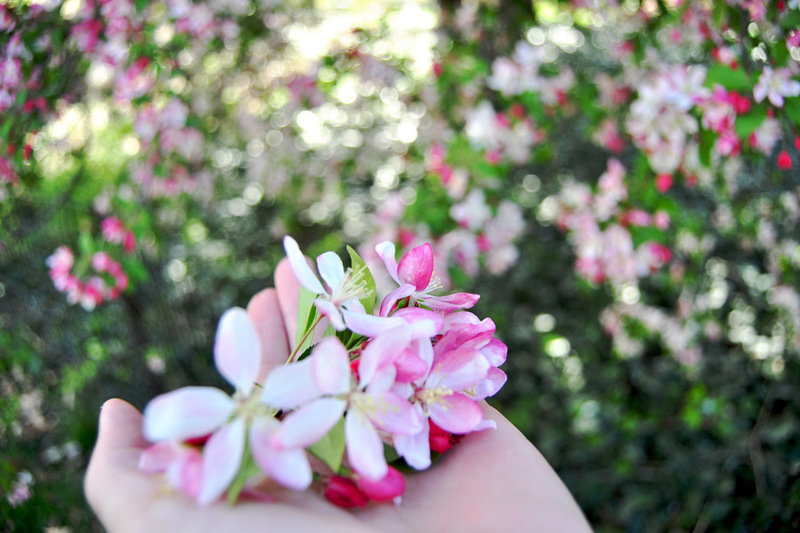 A divine fragrance, begging to be bottled. A few sprigs plucked; their sweetness saved for memory. Green against amber against white against pink. 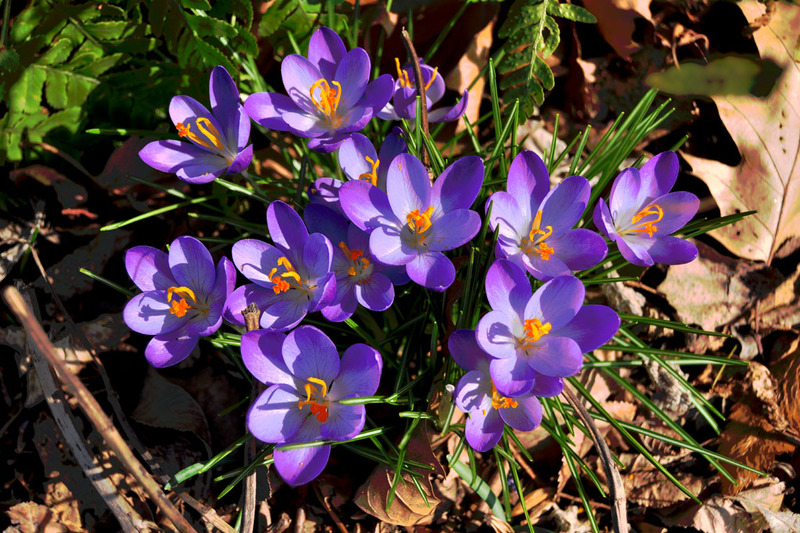 Spring’s best offering – a palette of amazing colours. 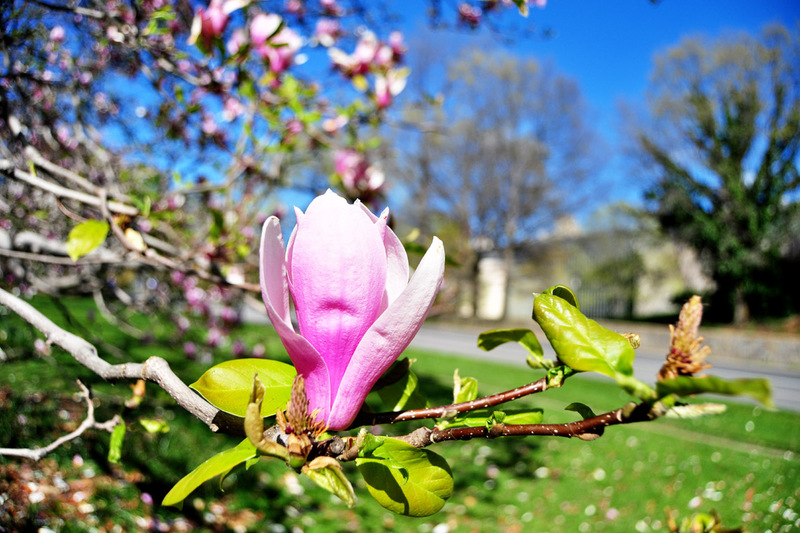 The undeniable beauty of the magnolia bloom; so pretty yet so stoic. 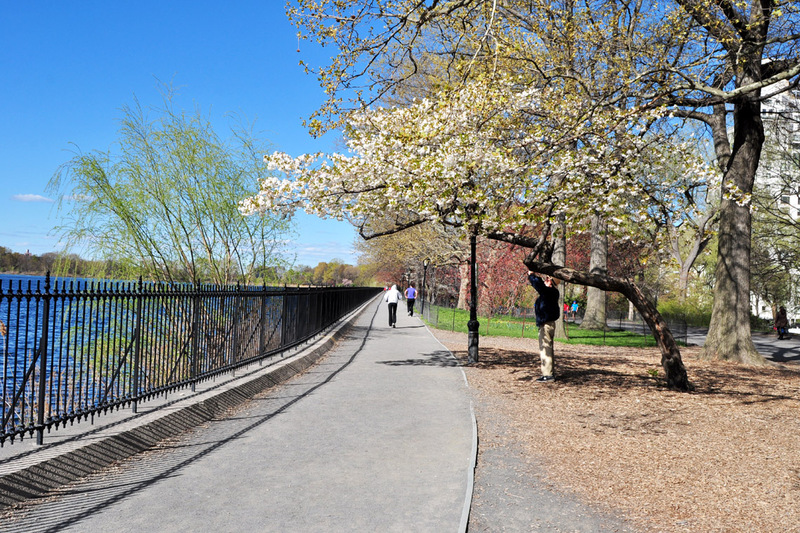 … water – to the left, and a cherry blossom directly ahead. Another happy snapper in the midst. 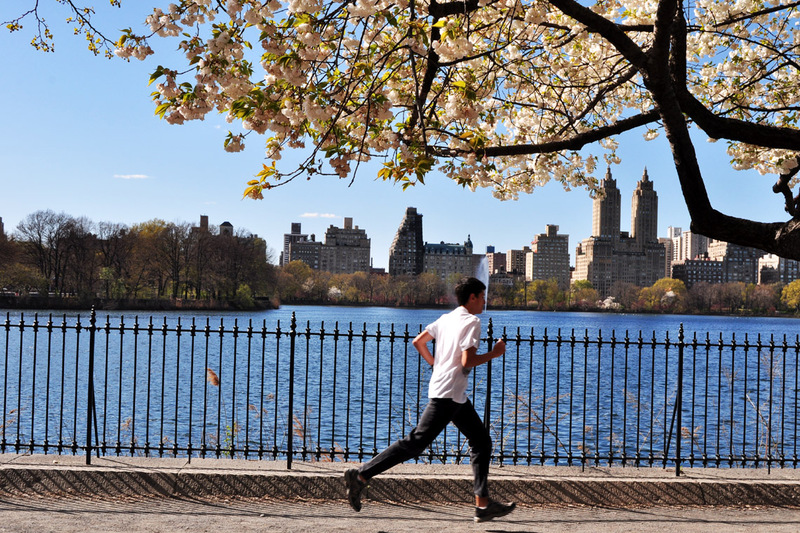 Musings, under the shade of the cherry blossom tree….Maybe I should give jogging another try…? 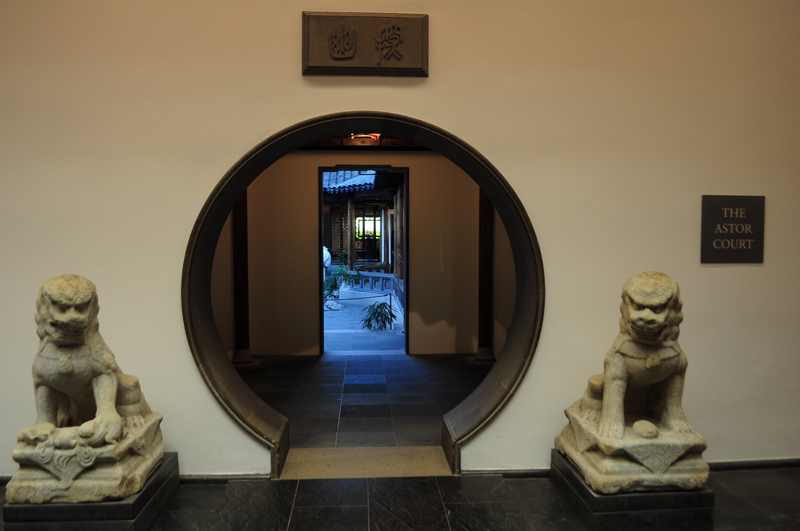 Gorgeous entryways, detailed architecture… still in the peaceful 80’s. Where is everybody? Spoke too soon. Steps away. Bustling New York. 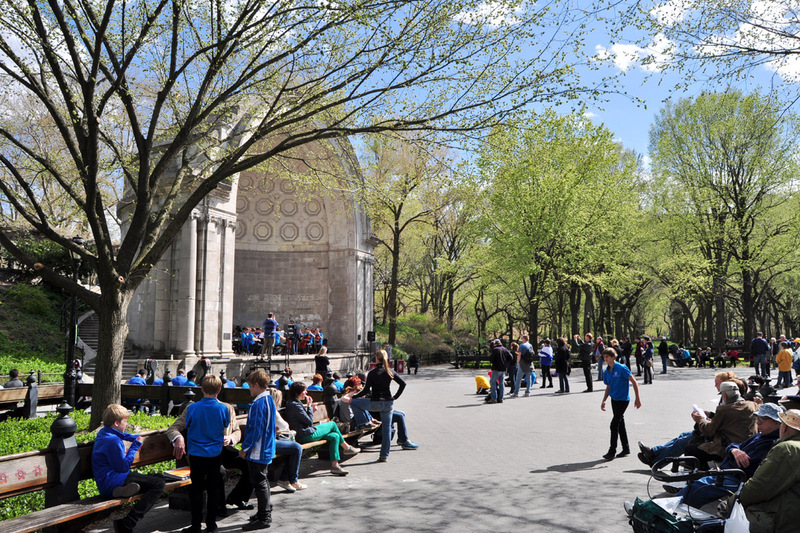 For perspective, an interactive map of Central Park can be accessed here: Central Park Maps | Your Complete Guide to Central Park. 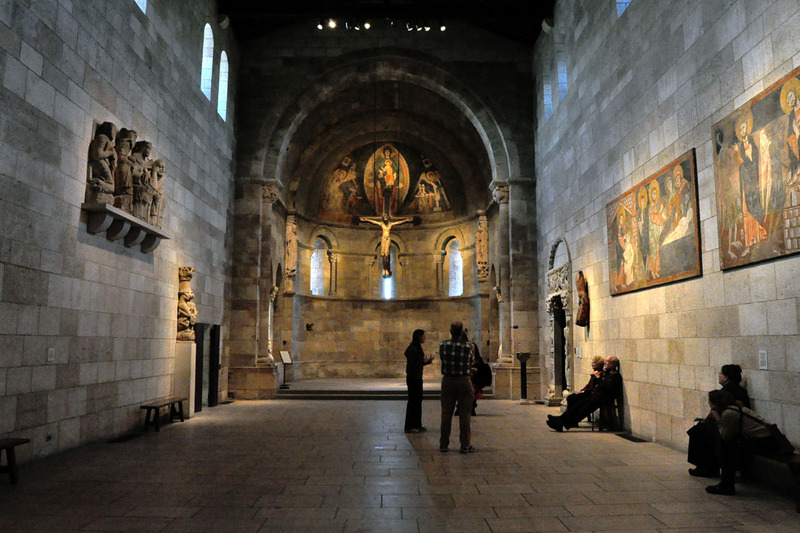 The Cloisters display up to 5,000 art works. 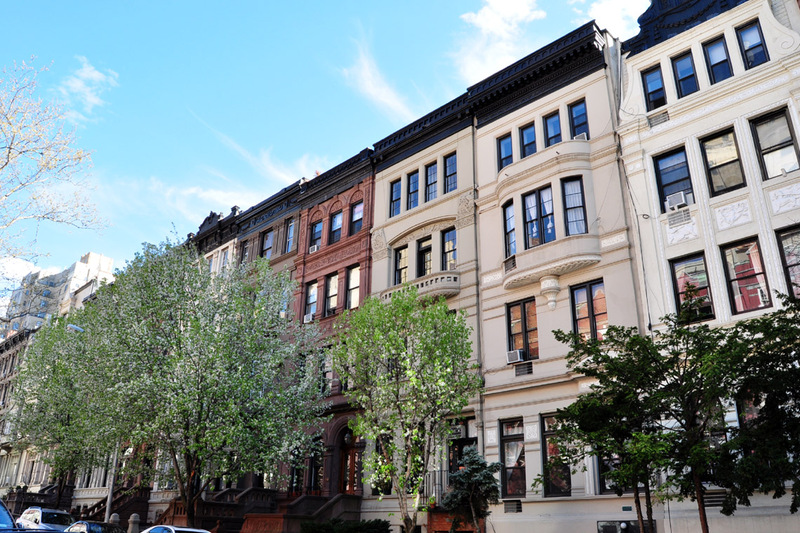 If you can get to this gem in uptown Manhattan, you won’t be disappointed. If you cannot get there, here’s a tour of the highlights. Enjoy! 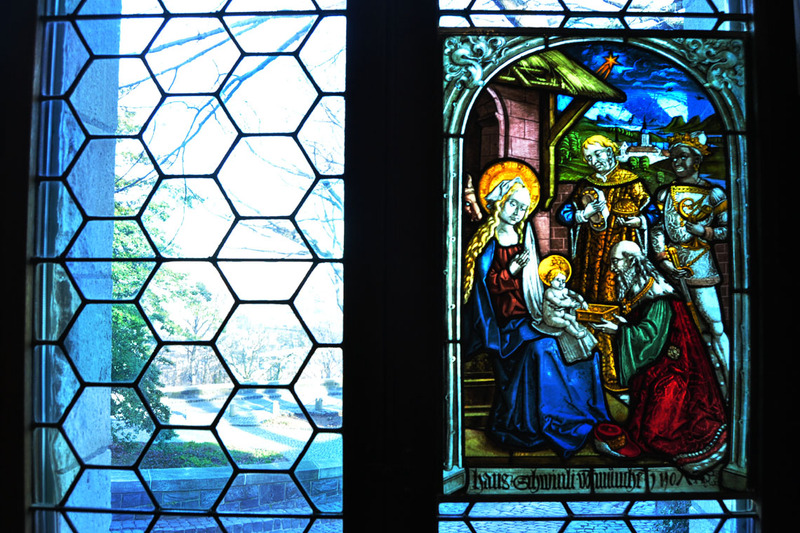 The Nativity tapestry (1500-1520) hangs by the doors leading to The Late Gothic Hall. 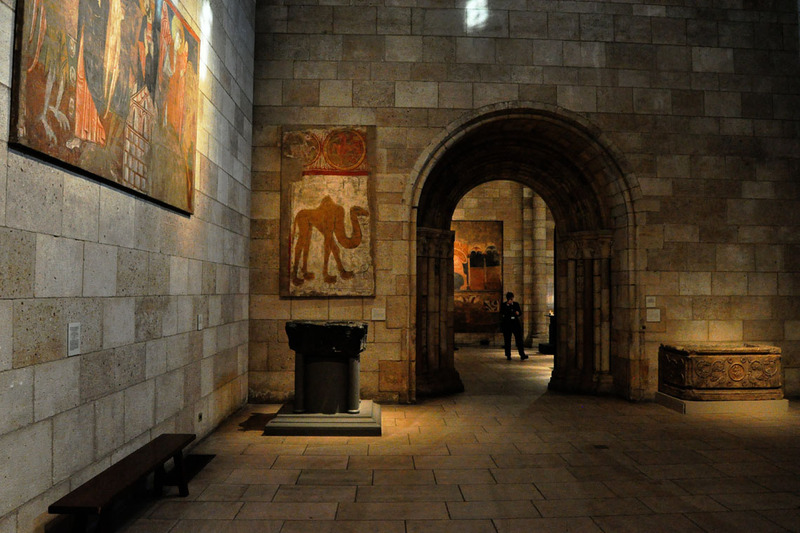 This 27 by 13 foot artwork was vandalized prior to its acquisition by The Cloisters in 1938. In 1967, the Department of Textile Conservation identified that the tapestry had been cut into four irregular pieces and badly stitched back together. This prompted its laborious restoration. 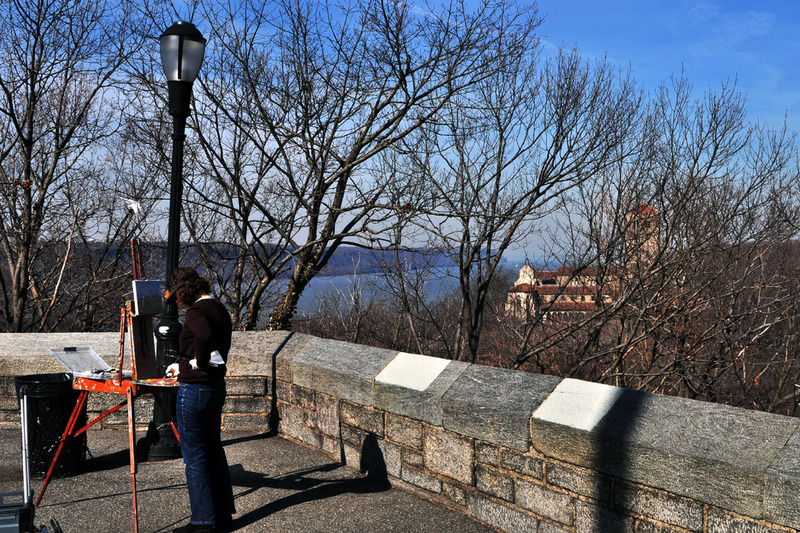 Conservators Alice Blohm and Tina Kane led the meticulous conservation process from 1973 to 2009. The team restored missing yarns, weaved holes together, and reconstructed missing areas. 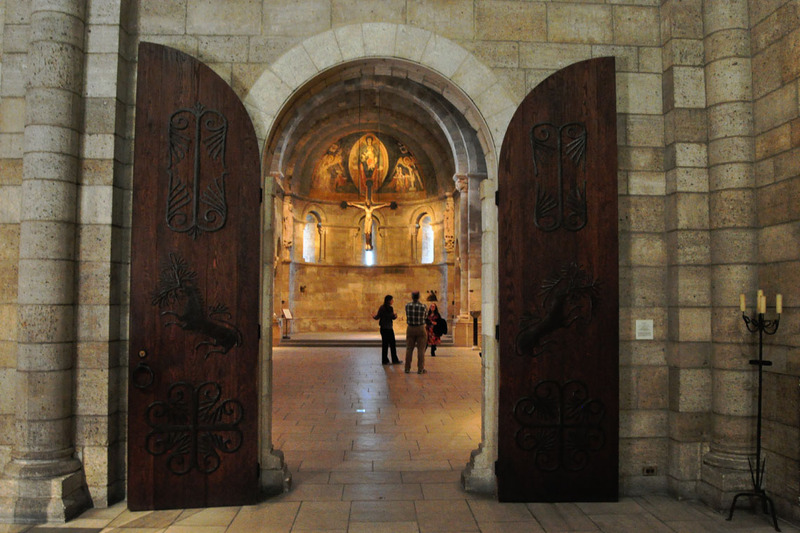 The cavernous Romanesque chapel features a barrel vaulted ceiling, and is filled with grand paintings and sculptures. 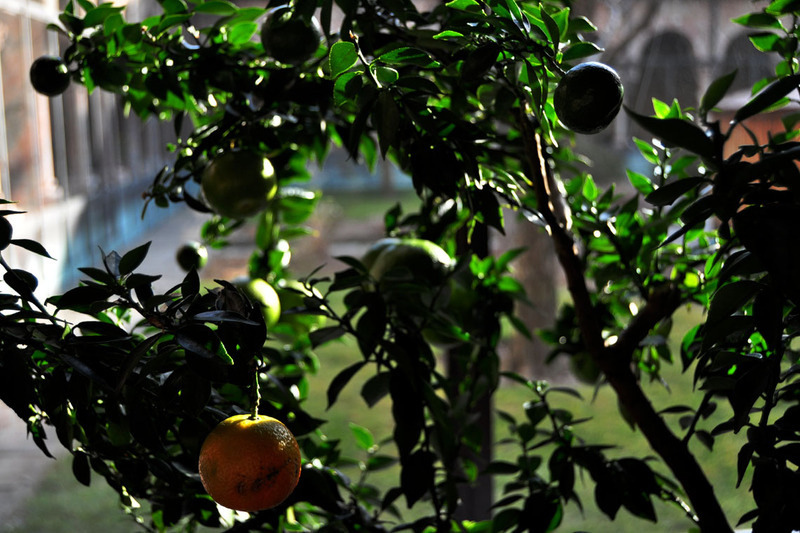 India and China introduced bitter and sweet oranges to Europe from Asia, with bitter preceding sweet by five centuries. 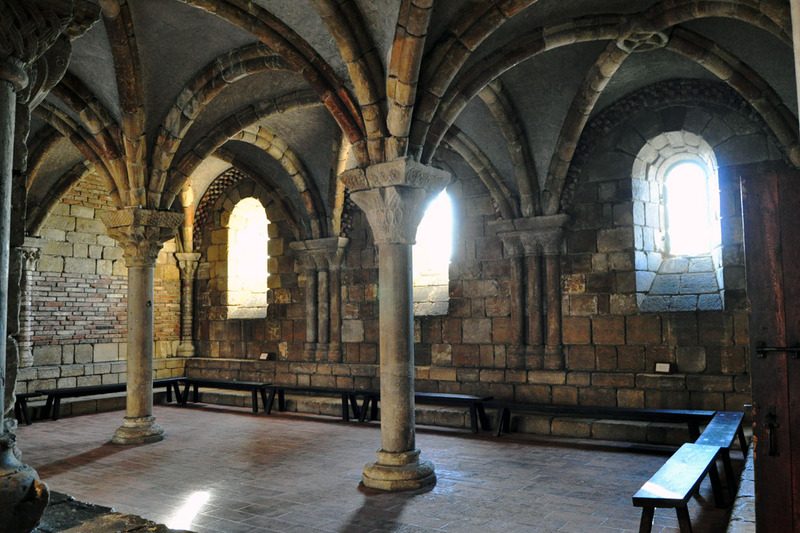 In the 12th century, The Chapter House was a meeting space. Fast forward 900 years, and it was a stable. 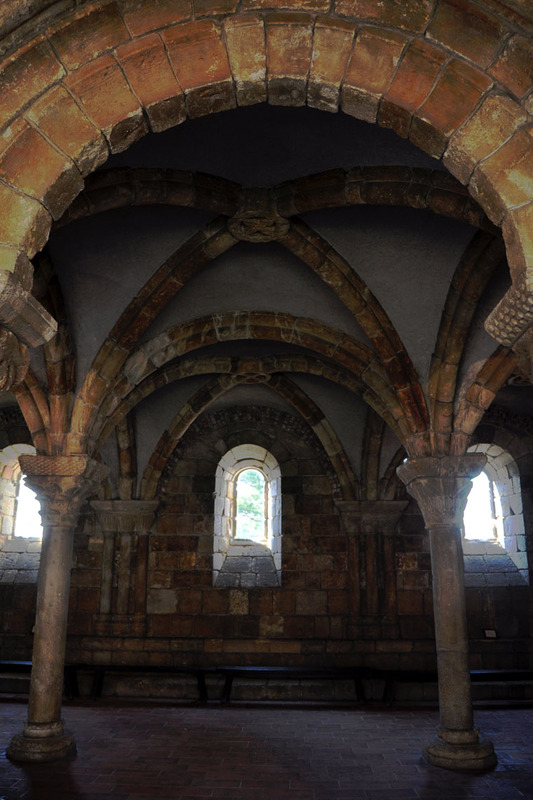 Wooden benches line The Chapter House, whose stone pillars, decorated with rose and pine cone carvings, support a rib-vaulted ceiling. 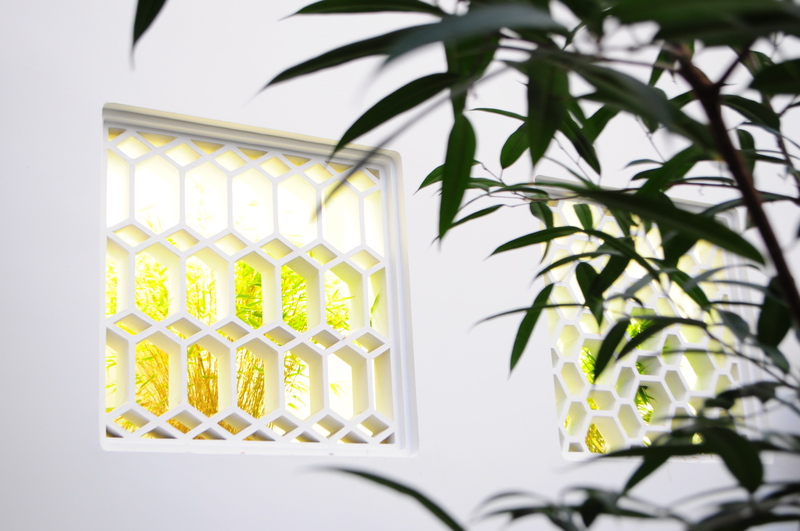 The space is infused with soft light thanks to the arched windows along one side. 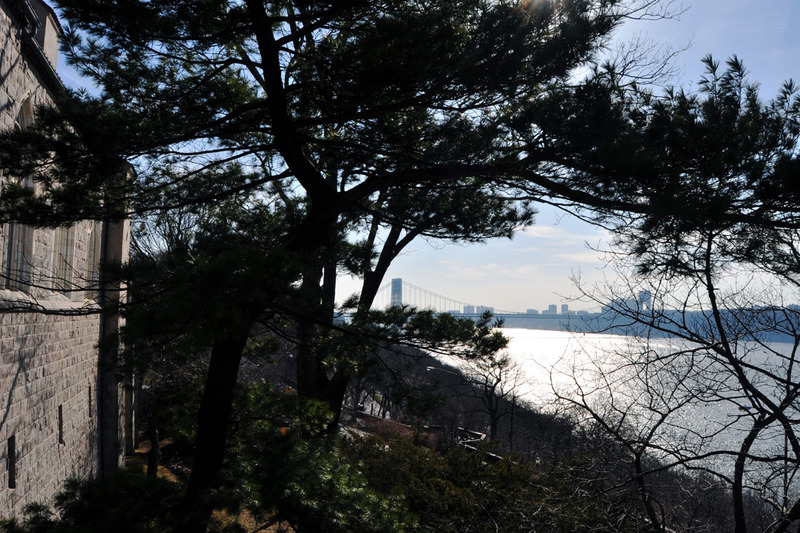 The West Terrace overlooks the highest point of Manhattan, providing a great view of the Hudson River, the New Jersey Palisades, and the George Washington Bridge. 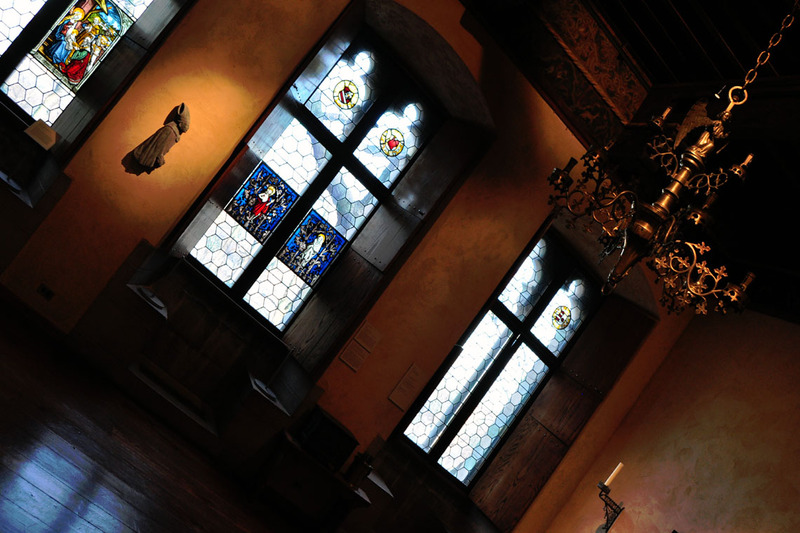 The Merode Room, named for the Merode Altarpiece, displays art used in private devotion. 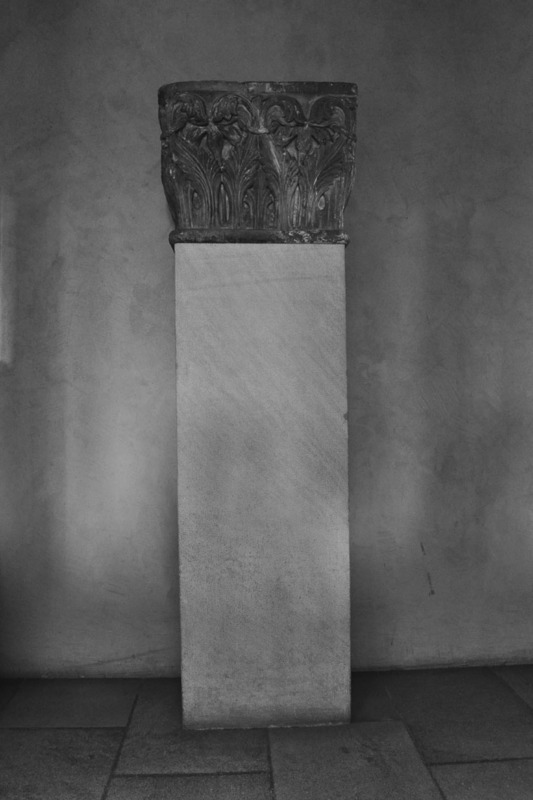 Columns, such as the one below, were used as decoration in the Benedictine abbey of Notre-Dame de la Grande Sauve. Can you see the leaf motifs? 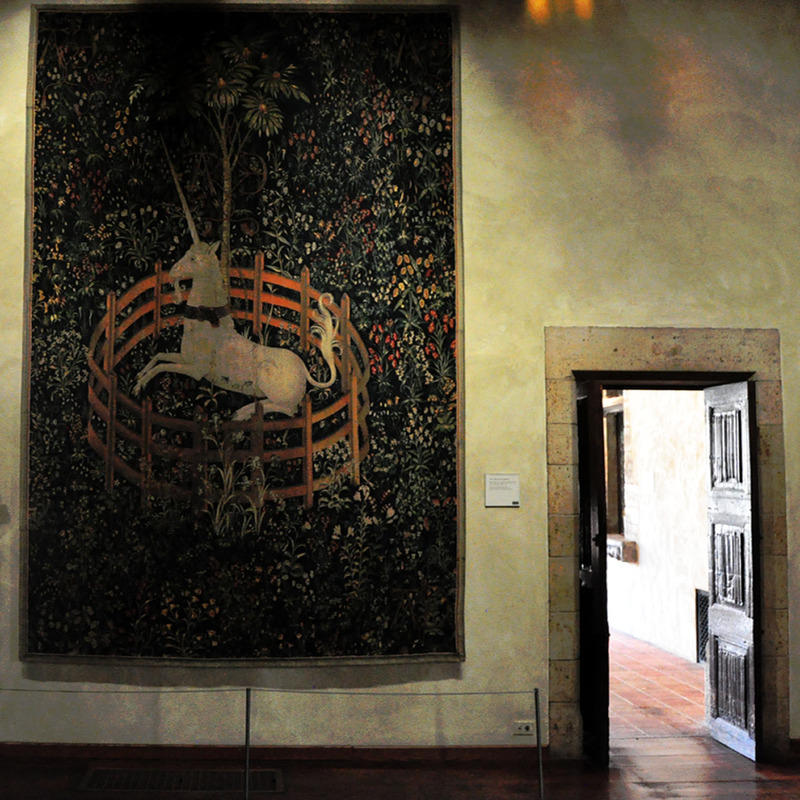 The surronding gardens are waiting for spring, but the flowers adorning the Unicorn Tapestries are always abloom. 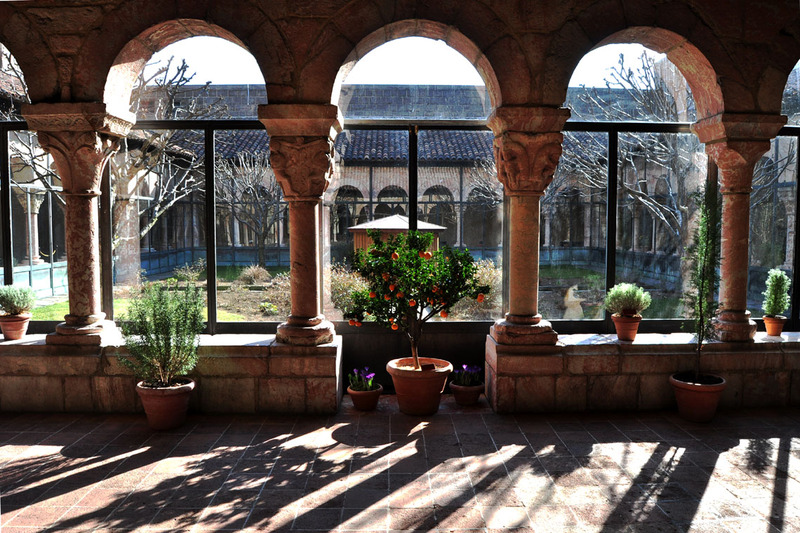 Its millefleurs (millions of flowers) reflect the museum’s Trie Cloister Garden. 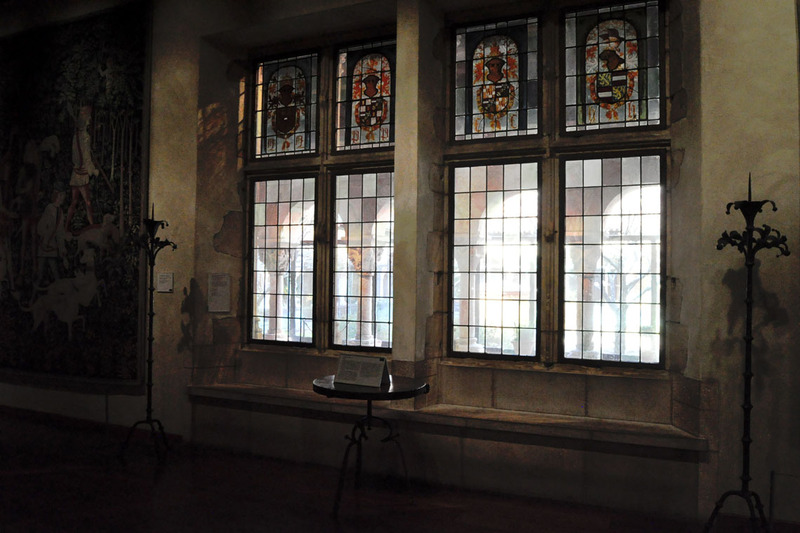 Note: the landscape woven into Middle Ages tapestries was also used to evoke ambiance and emotion. 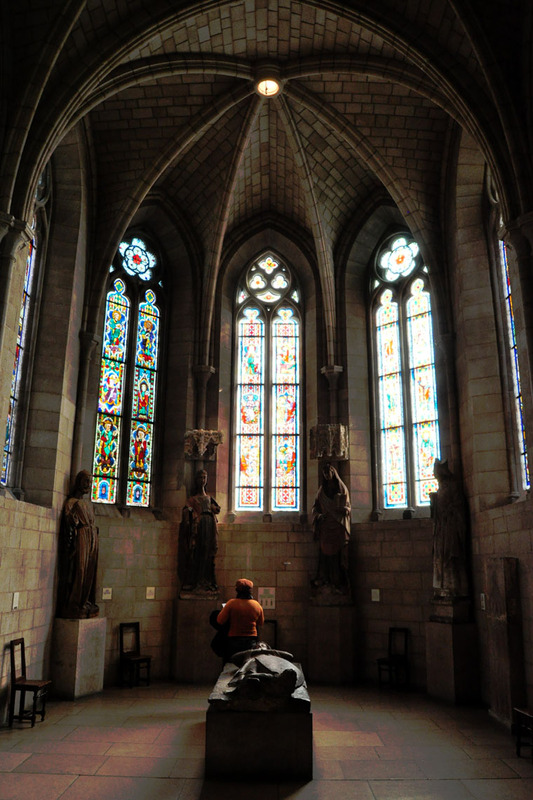 As light shines through 14th Century Austrian stained glass windows, The Gothic Chapel’s tomb effigies come alive under splashes of colour. 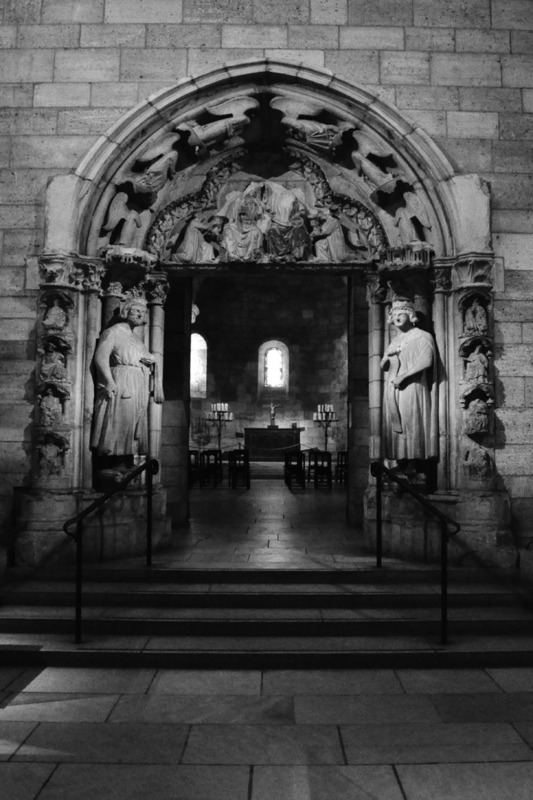 A doorway looking into Langon Chapel. 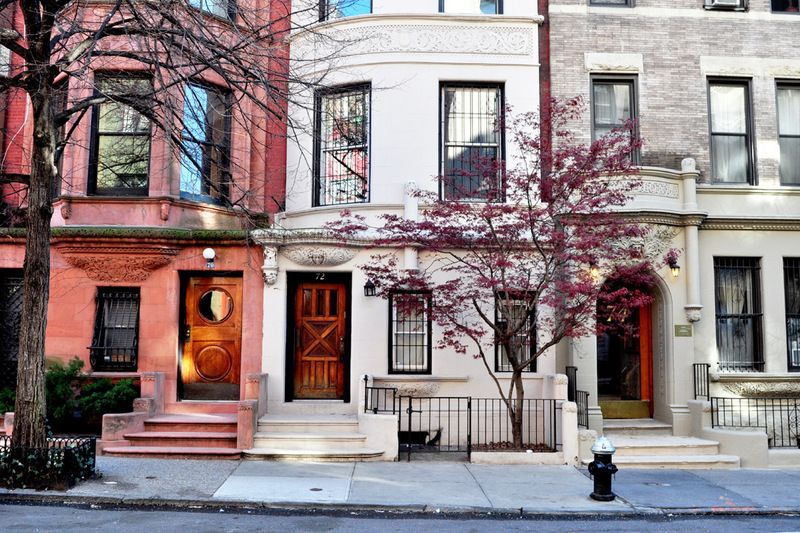 The uneven driveway is made of original Belgian blocks from old New York streets. 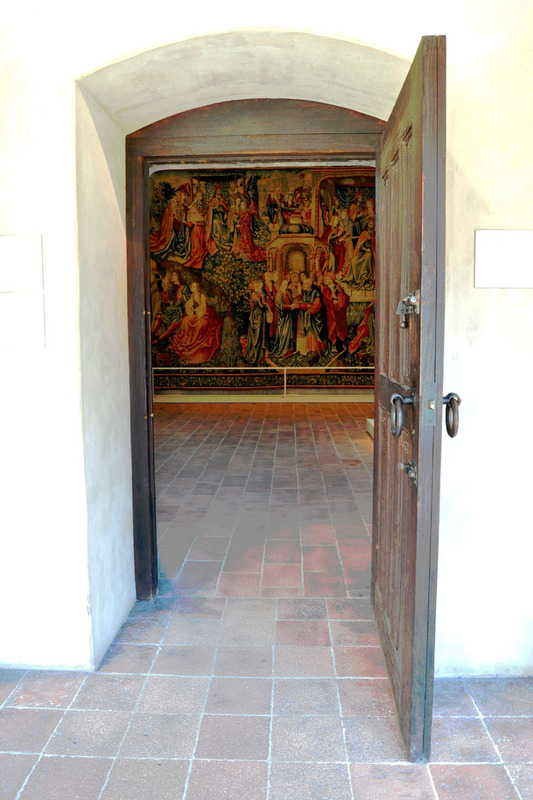 More Information: The Burgos Tapestry: A Study in Conservation. 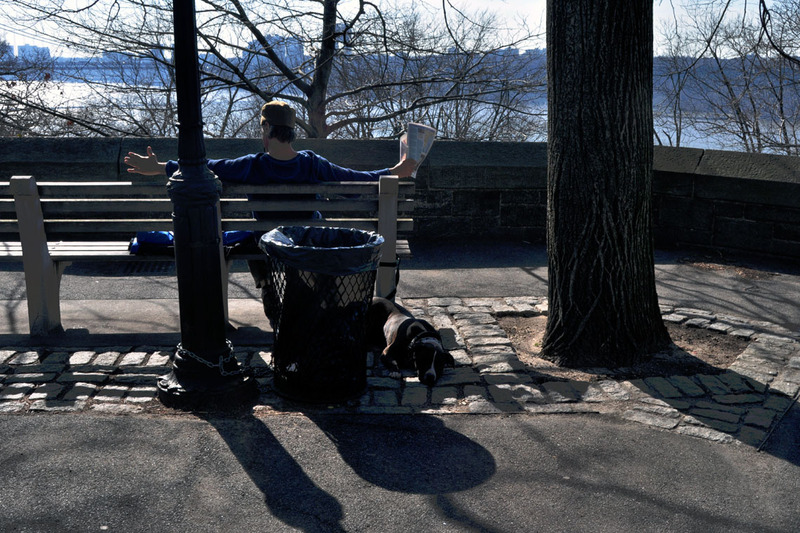 It’s tough being a tourist in New York. In an ever-changing city, there’s always an exhibition, restaurant, or landmark to jot on the to-do list. It’s hard to do and see it all in a matter of days, let alone a couple of weeks. 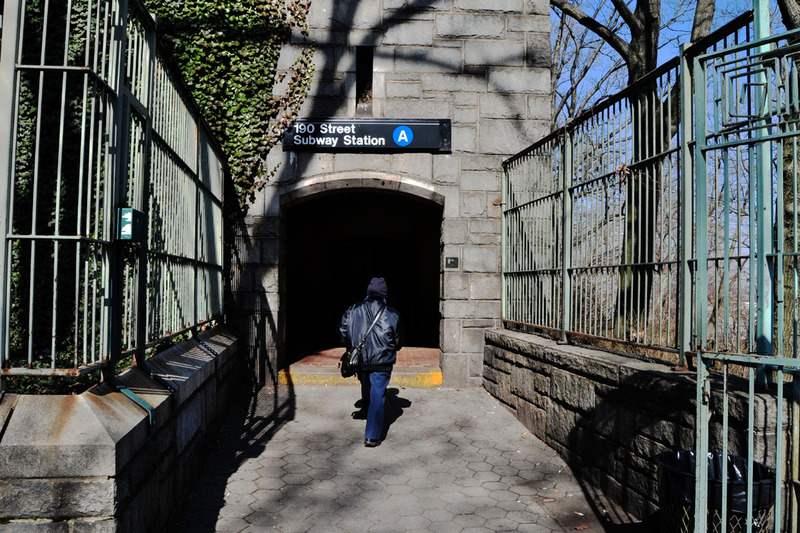 Strolling from East Manhattan to West, riding the subway from uptown to downtown, taking a cab from hotel to restaurant to bar, you probably won’t make it beyond Central Park. 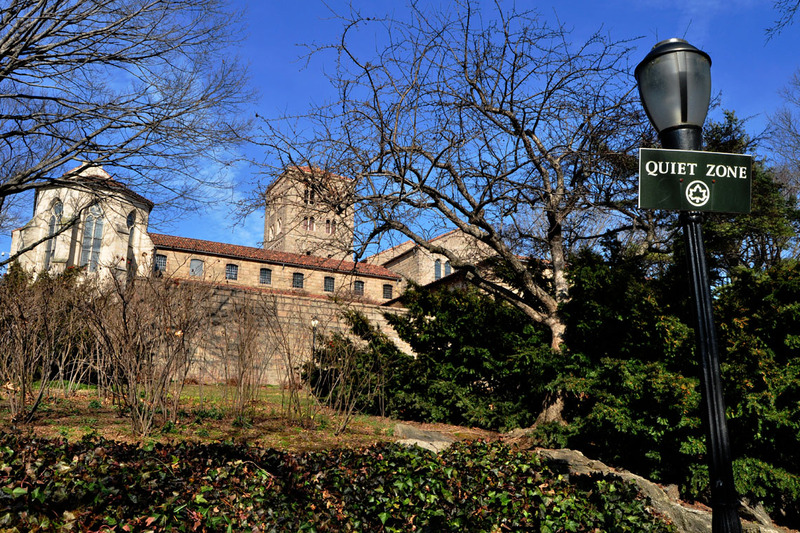 So, it’s no surprise that there are hardly any tourists at Fort Tryon Park and The Cloisters, located in the far reaches of Manhattan. I only visited today, and I’m a resident. 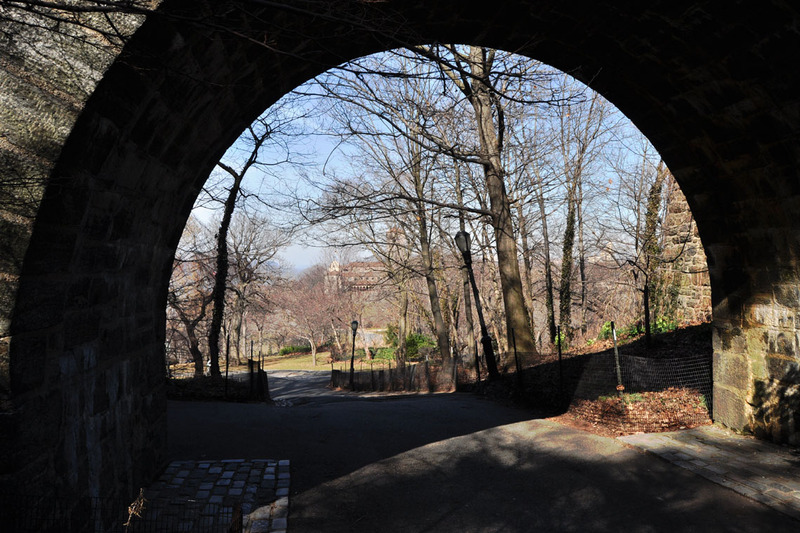 Exiting the 190th Street Subway, I found myself in the midst of Fort Tryon Park, located in the Washington Heights region of NY. 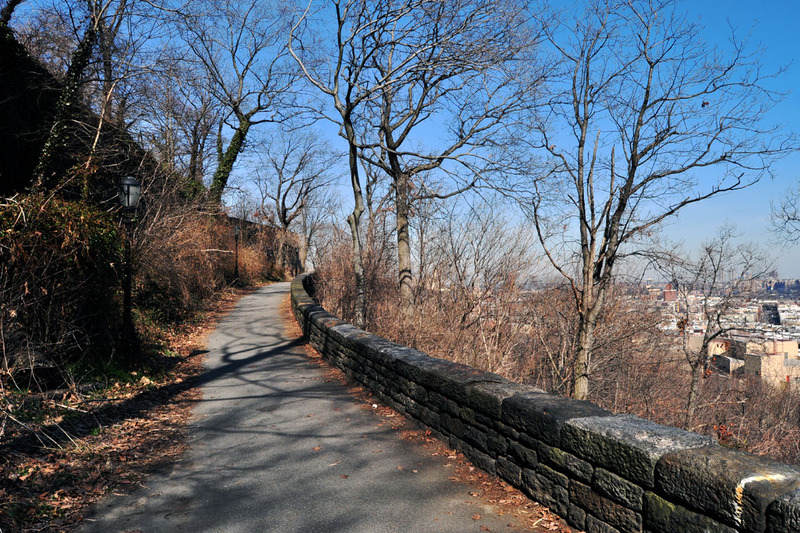 Fort Tryon’s land was purchased by John D. Rockefeller in 1917, who envisioned the park, which he later donated to New York City in 1935. 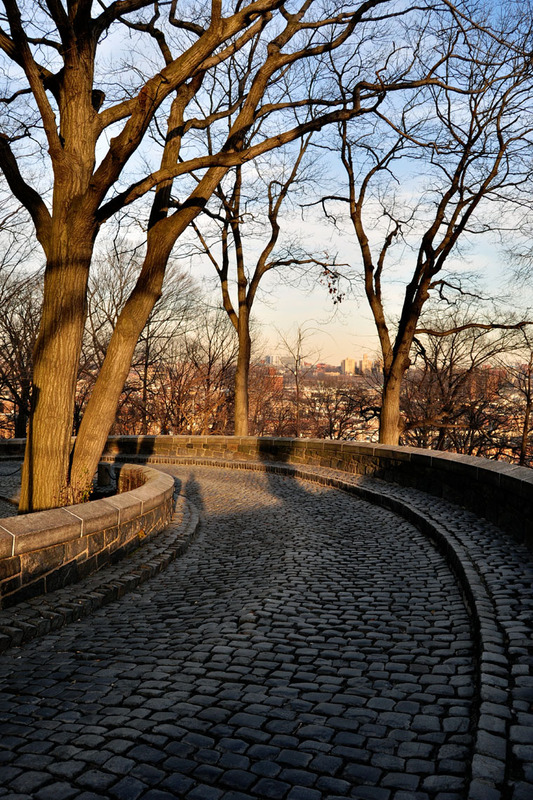 It took four years for head designer, Frederick Law Olmsted Jr., son of Central Park’s architect, complete its design. 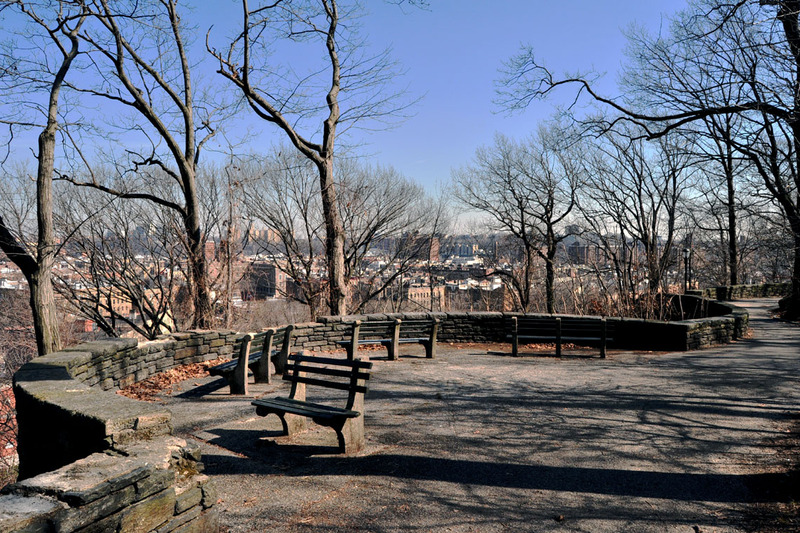 Fact: Fort Tryon Park is one of the highest points in New York. 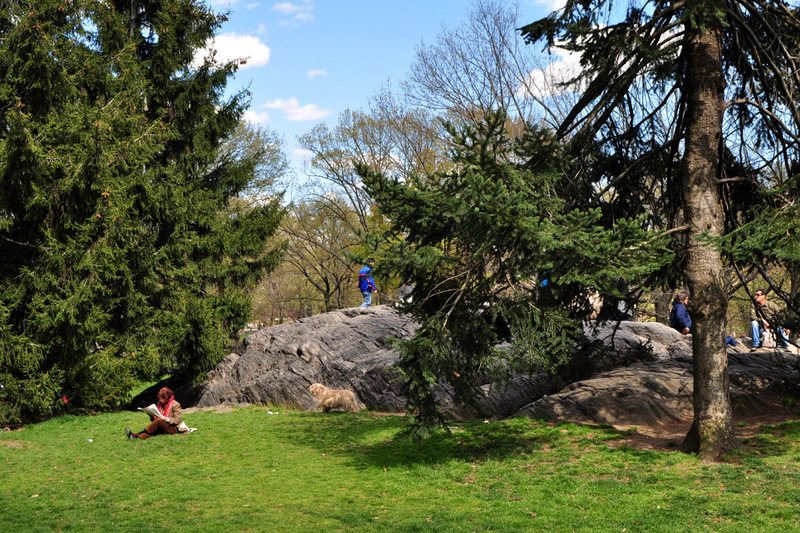 Despite the twisting pathways, never-ending steps, and steep slopes, the park is relaxing to explore. 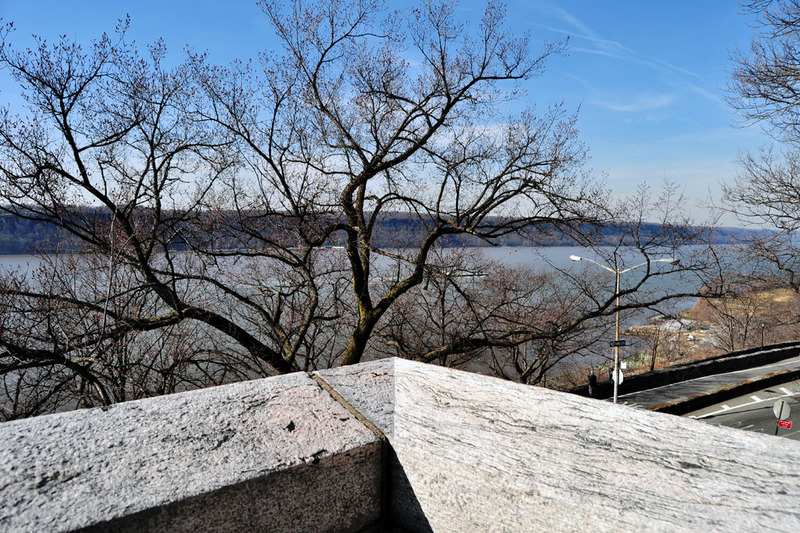 From here, I enjoyed views of Palisades State Park, which, located on the other side of the Hudson River, Rockefeller had also purchased in order to preserve Fort Tryon’s outlook. 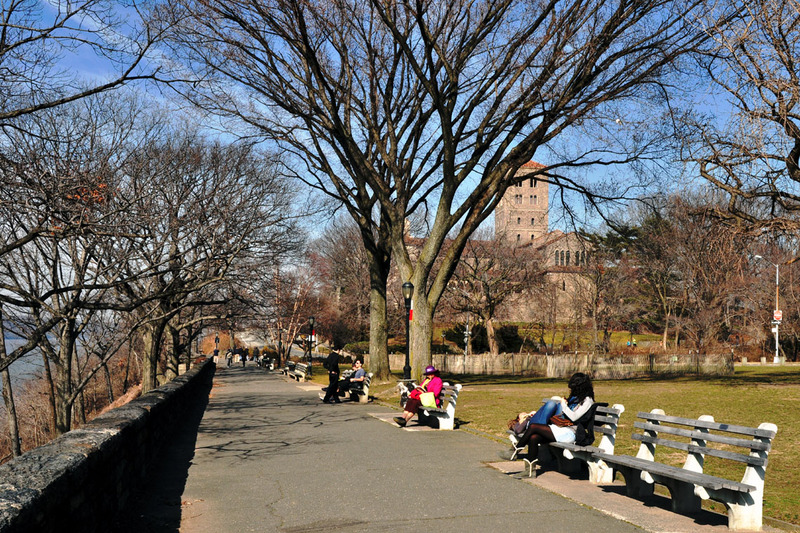 The park’s benches are ideal spots for daydreaming. 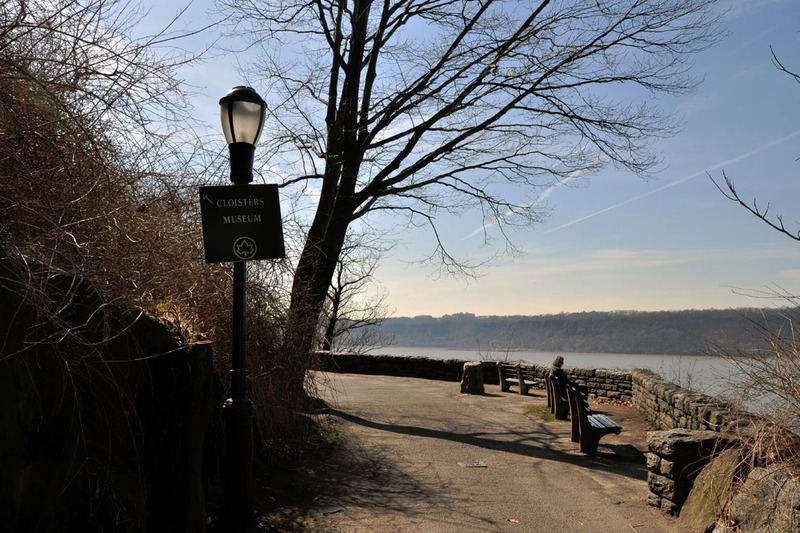 Fact: Fort Tryon Park fell into decades of neglect and its cleanup efforts were spearheaded by actor Bette Midler. 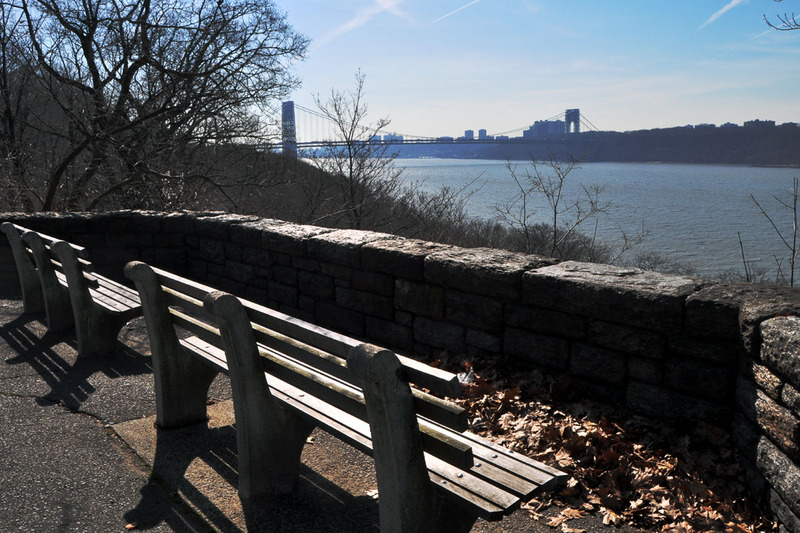 Bette, friends and family started removing garbage from Fort Tryon Park and Fort Washington Park. 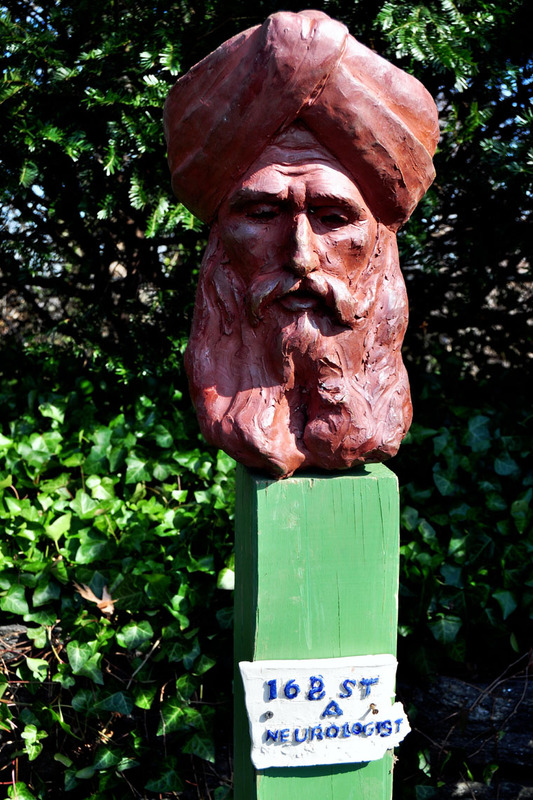 This grassroots effort led to her to found the non-profit New York Restoration Project (www.nyrp.org). 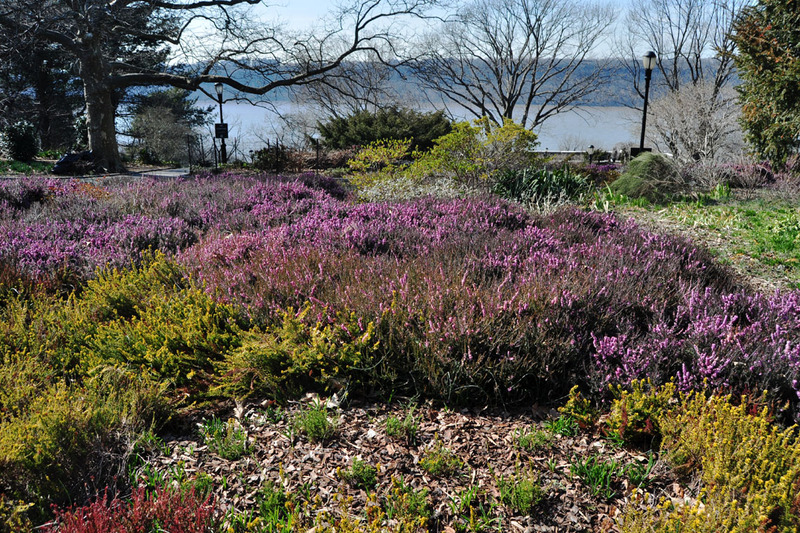 I noticed visitors taking a breather, stretching their legs, while strolling through the English-inspired Heather Garden. 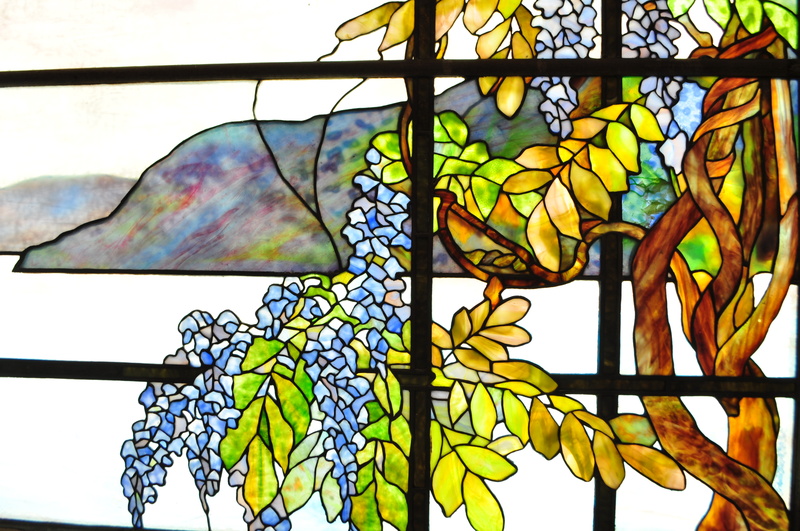 Flowers in purples, yellows, and whites, surrounded by buzzing bees, welcome the new season. 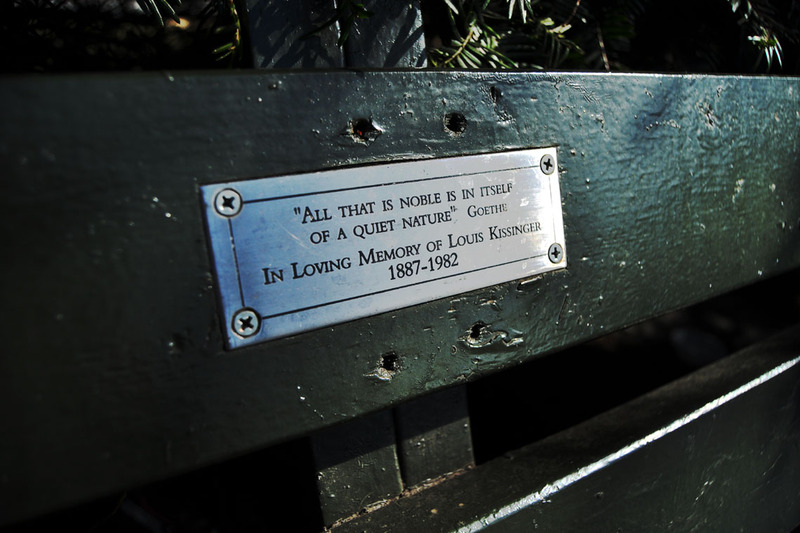 Plaque dedications mark benches in seating alcoves along Stan Michels Promenade. 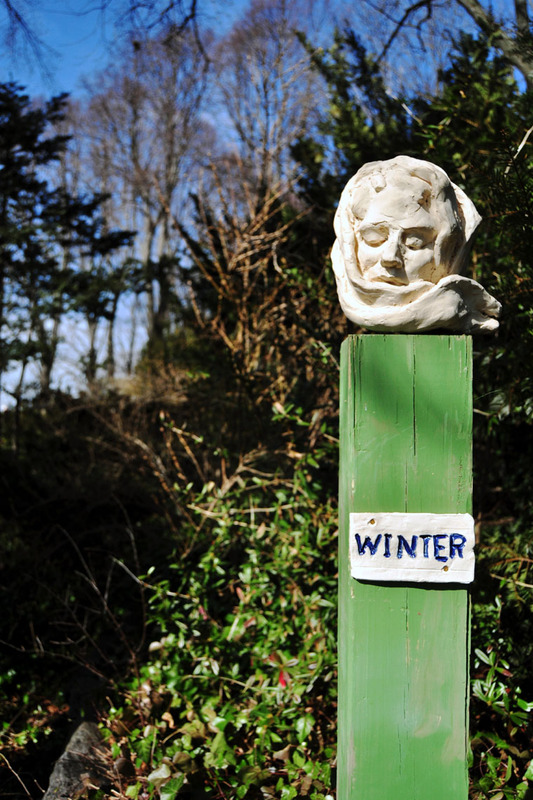 Clay sculptures, part of a proposed public art project, demanded my attention. 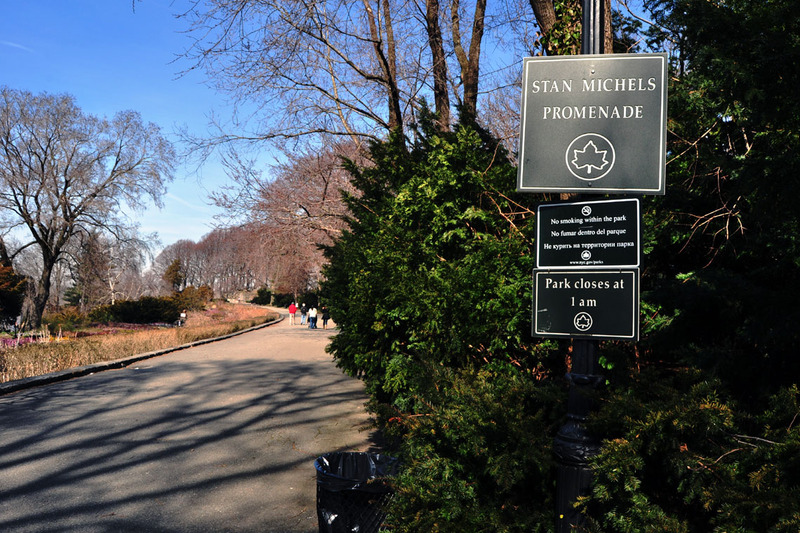 FACT: Stan Michels Promenade is named for New York City councilman Stanley Michels, an ardent supporter of environmental reform and park restoration. 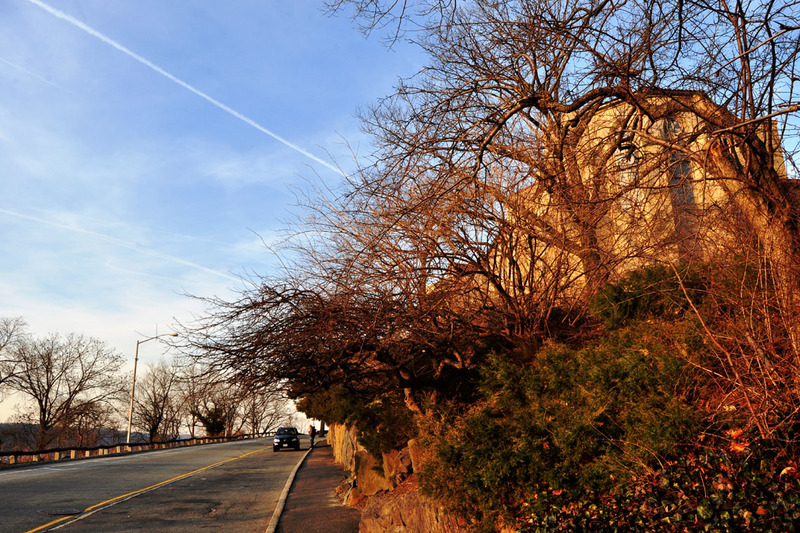 A visit to Linden Terrace meant standing in the shadow of linden trees. 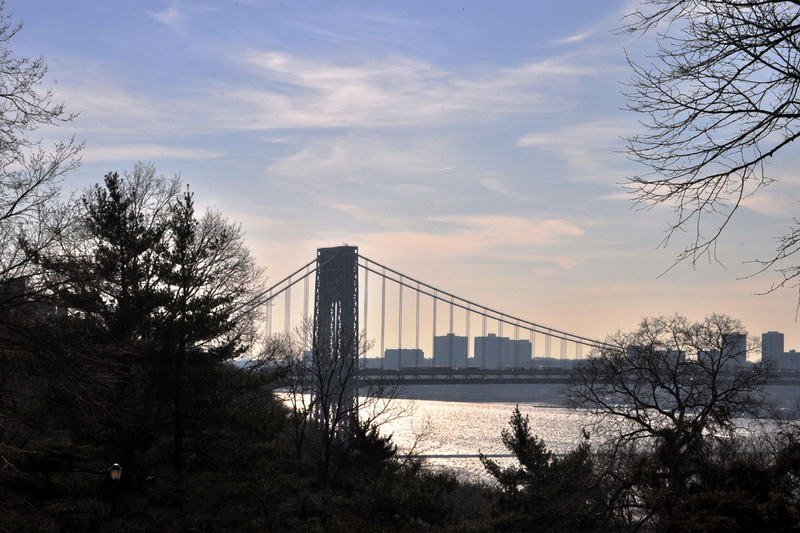 In the distance, I saw the George Washington Bridge. 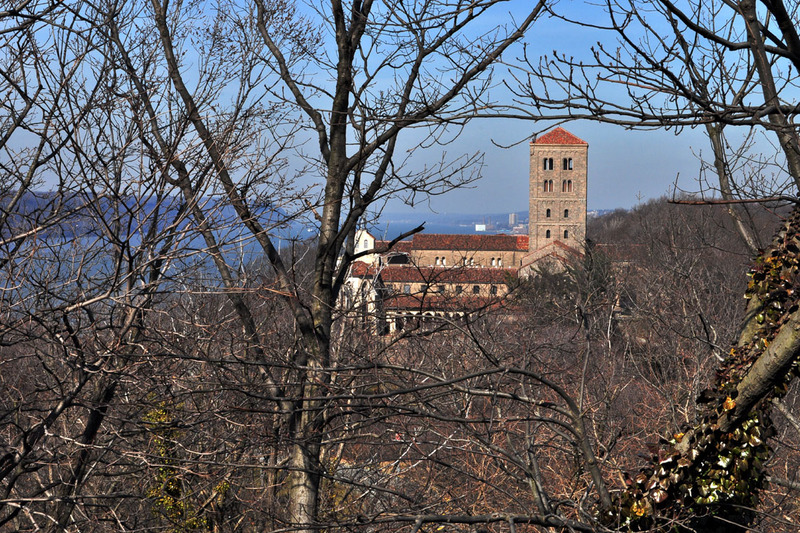 I spotted the tops of the Cloisters building through a thicket of branches. 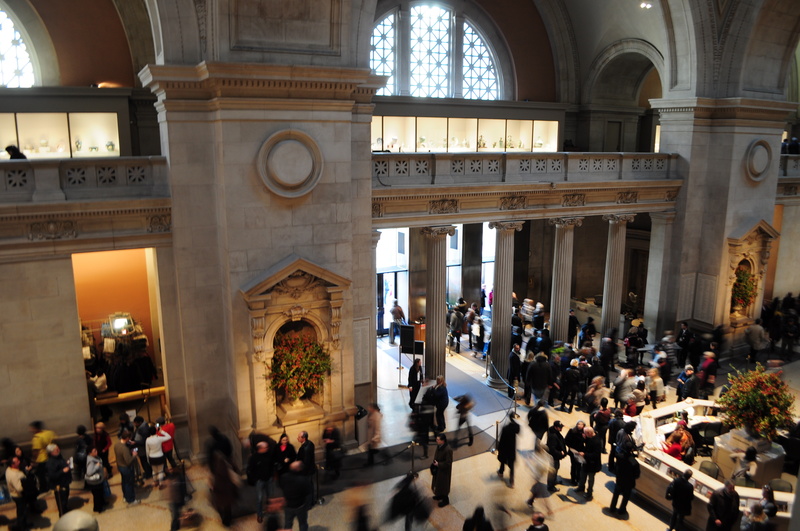 The Metropolitan Museum of Art is to New York (The Met) what the Musee d’Orsay is to Paris, and the Hermitage is to St Petersburg. 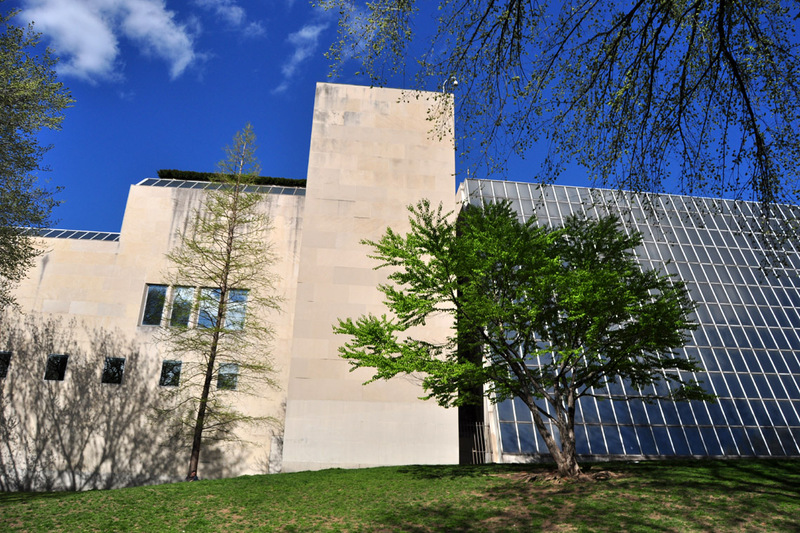 That is, an outstanding big-city museum that’s too large to explore in one day, filled with fascinating exhibits, awe-inspiring artifacts and archaeological collections. 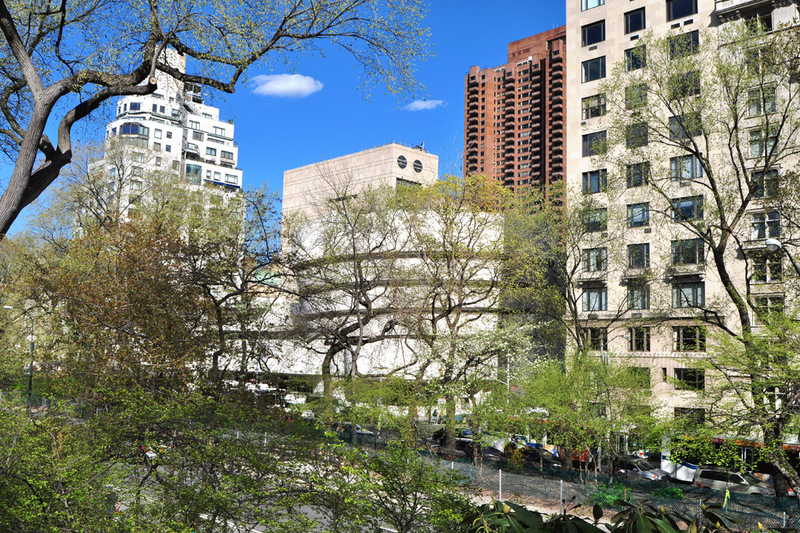 Abutting Central Park by Fifth Avenue and 82nd Street, the Met is located in my extended backyard. 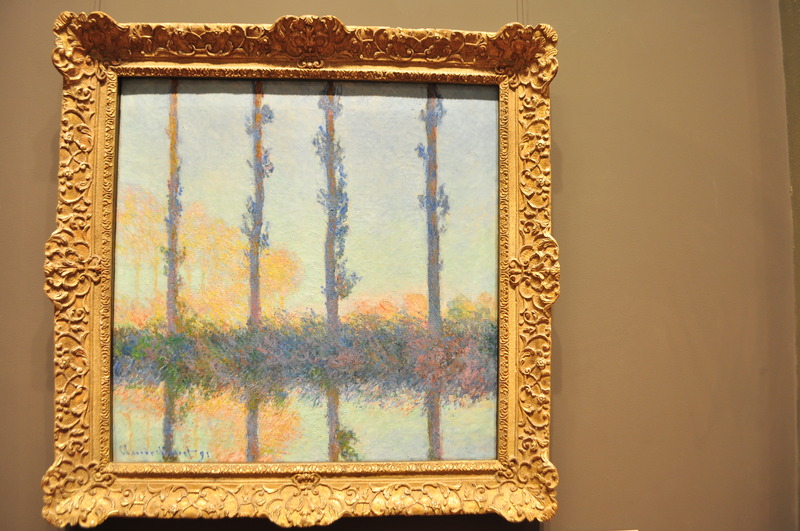 After a visit, I’m always inspired, whether by the Impressionist works of Monet, the Egyptian artifacts, or the pre-Columbian gold. 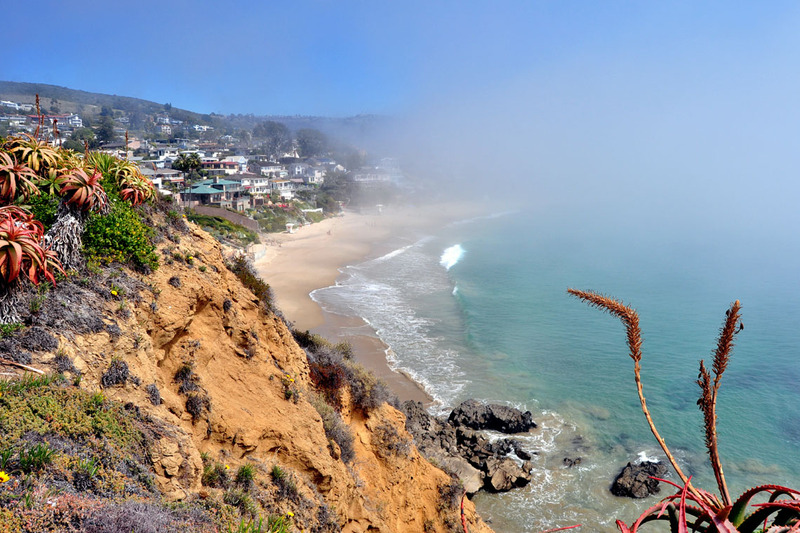 The get that giddy feeling that makes me want to travel. On the flipside, I find too much inspiration overwhelming. 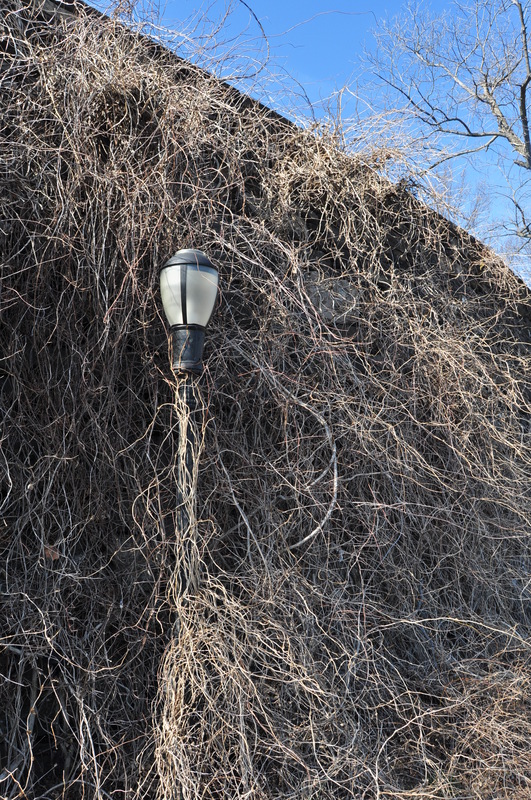 When this happens, I take pause in Ming Scholar’s Retreat, or what I call — the secret garden. 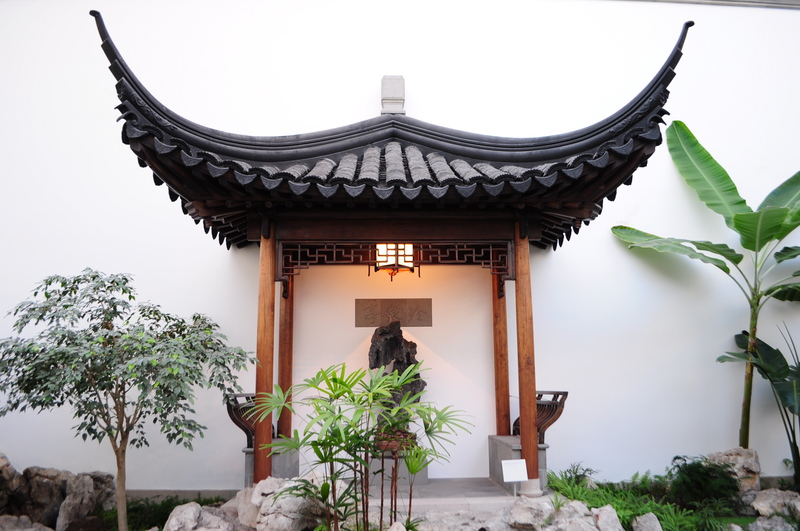 Well hidden between the Asian Galleries on the second floor, the garden is accessed through an moon gate crowned by a plaque — tanyou — that translates to In Search of Quietude. Only a handful of people are here at any one time, which makes you feel as if you’re the recipient of a golden ticket. 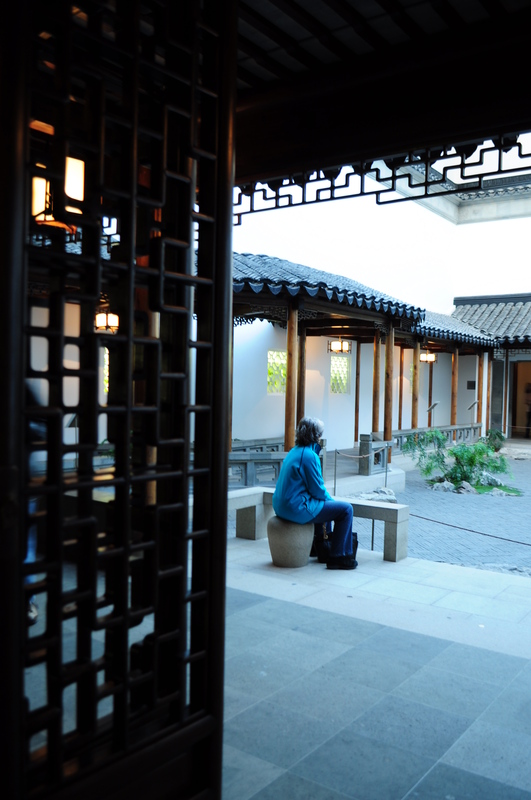 Formally called Astor Court (after its visionary and founding supporter Brooke Russell Astor), the garden is modeled “on a small courtyard within a scholar’s garden in the city of Suzhou, China, called Wang Shi Yuan, the Garden of the Master of the Fishing Nets.” I don’t know if anyone comes here to study or write, but the space allows for quiet contemplation, and functions as a place to sit down and rest the weary feet. 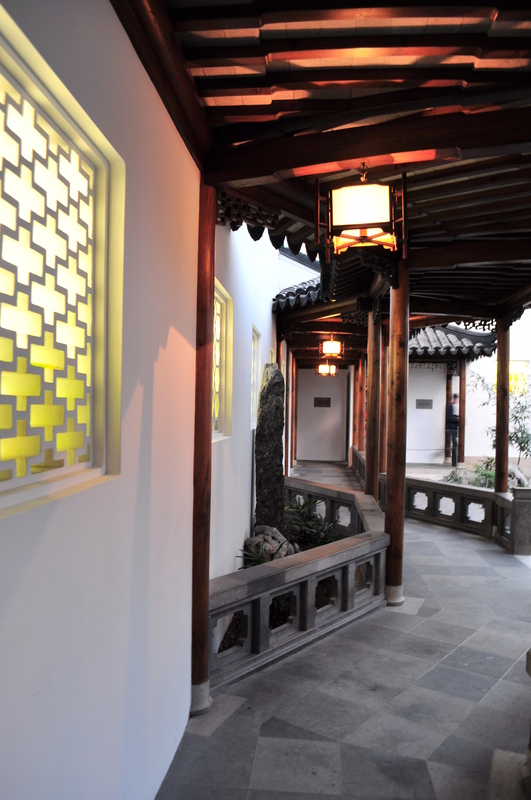 Influenced by the Ming Dynasty style and Yin-Yang principle, the garden courtyard was completed in 1980 and “assembled by expert craftsmen from China using traditional methods, materials and hand tools”. Having a skylight for a roof means you could see the moon if you were here late enough. Which wouldn’t have been such a crazy idea, especially given this evening’s lunar eclipse. 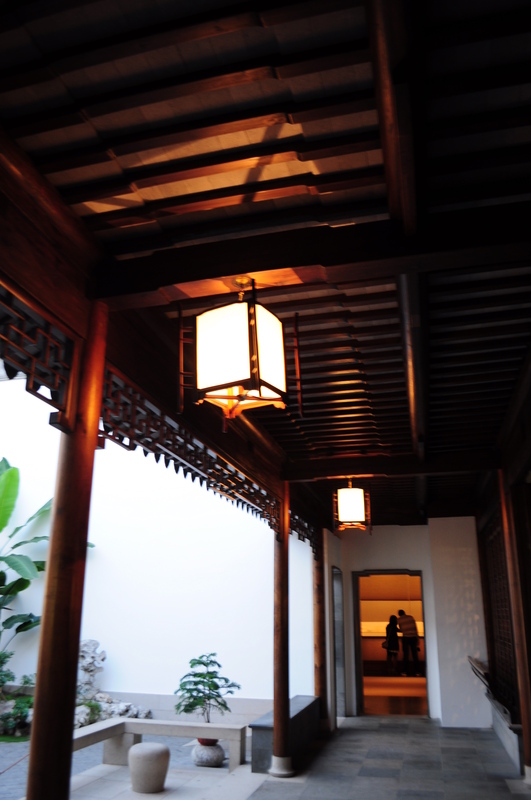 In the middle of to the terrace stands a doorway with a plaque — yashi — that translates to Elegant Respose. 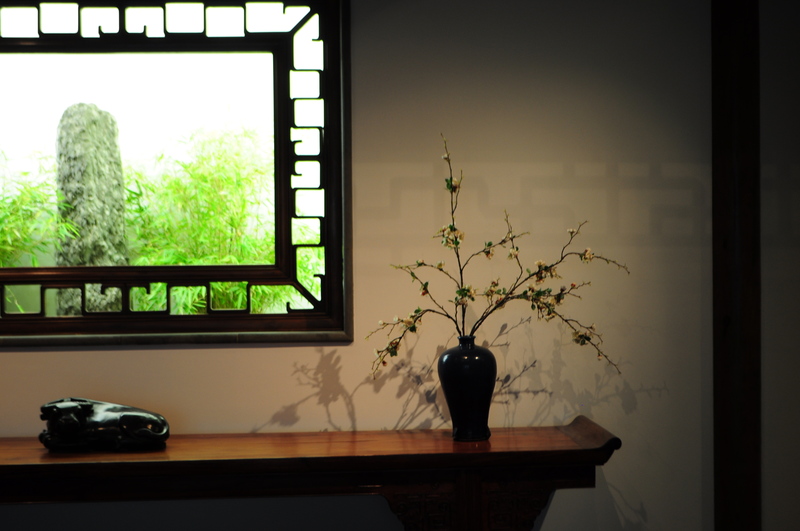 The surrounding windows are covered with wooden latticeworks through which one can see bamboo and grasses, as if to show what the landscape would have looked like. 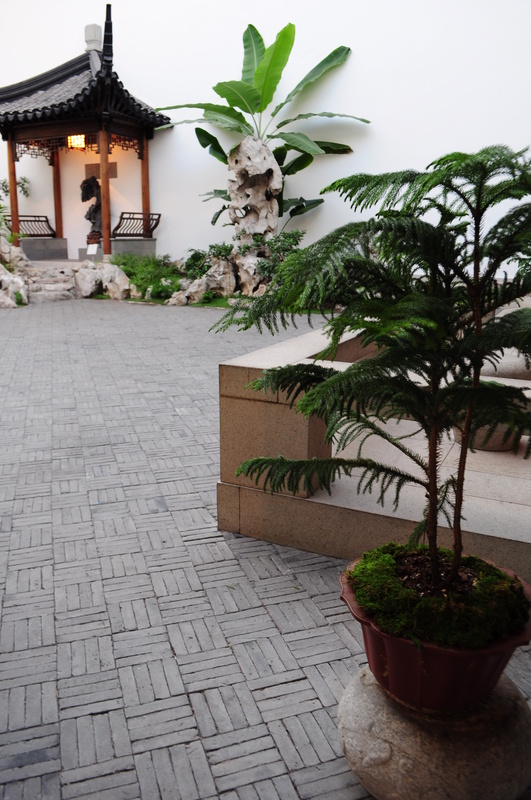 A sheltered walkway along the perimeter of the the garden functions as a place to sit. 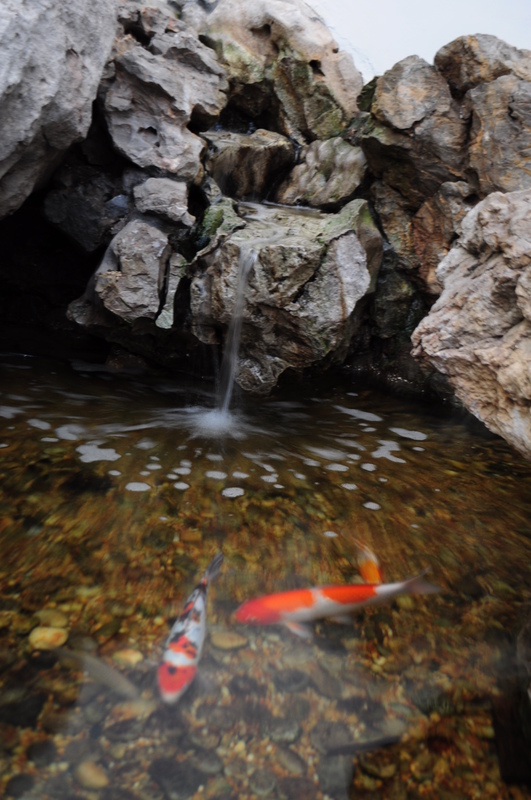 The hushed surroundings soak up the rushhhh of the Koi pond’s waterfall, surrounded by dark grey Ying limestone and eroded rocks sourced from the bottom of Lake Tai (China). 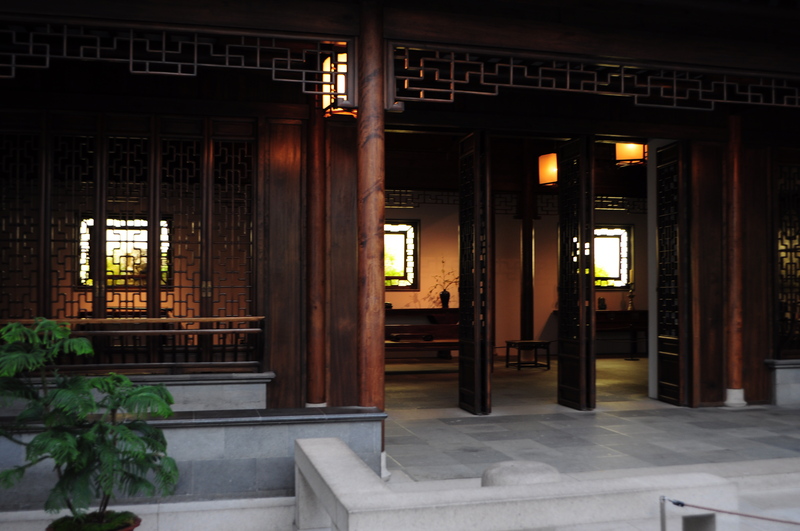 Located directly off the terrace is the Ming Room, also known as the Scholar’s Retreat, whose structure is made from imported Chinese wood: ginko and camphor were used for the latticed doors; fir for the ceiling beams; nan wood – an evergreen prized for its durability and soothing honey colour for the pillars. 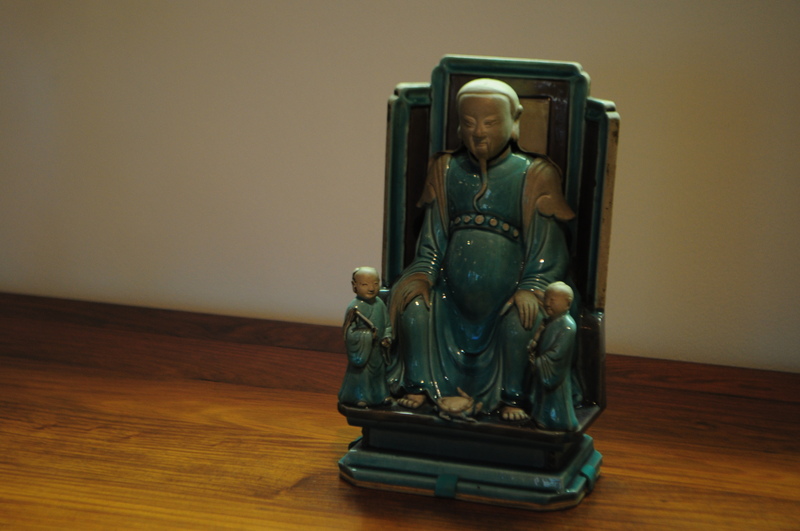 Decorative ornaments include a blue Meiping vase, pewter candlesticks, and a turquoise and aubergine glazed porcelain God. 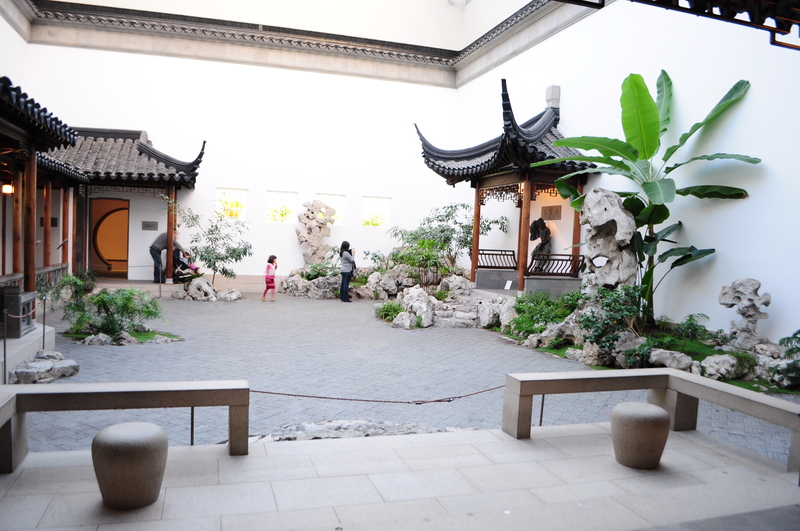 Astor Court is as much a gallery as the other parts of the museum. And yet, it is not a crowded. Although I have written about it here, I hope this spot stays a secret.